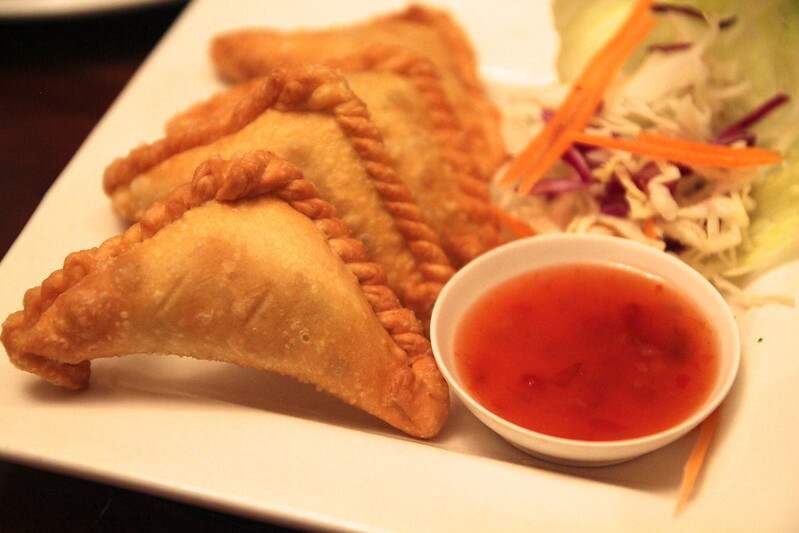 There are so many Thai restaurants to visit in Newtown that sometimes the choice can be a little overwhelming! Recently a group of friends and I ended up in Newtown for dinner and wound up at Thai Passion and really enjoyed the food, service and great prices! 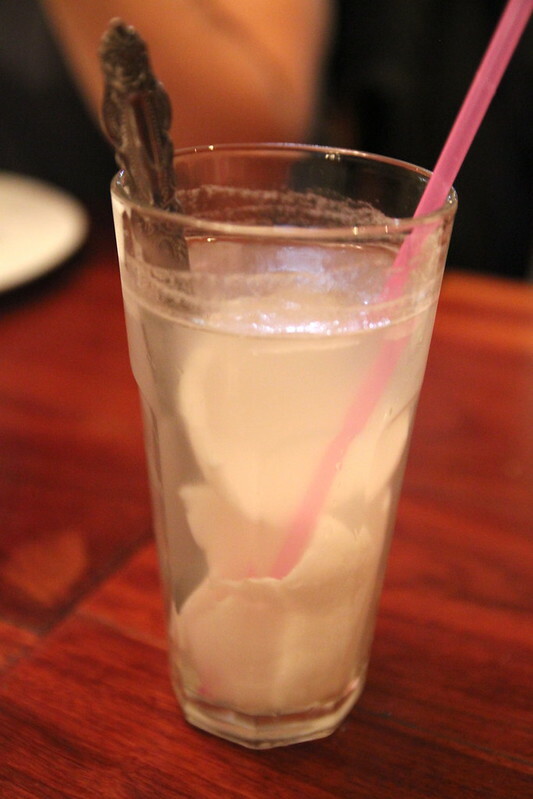 I really enjoyed this start to the meal – coconut juice is always so refreshing and the coconut meat slices were perfectly tender and soft. I really enjoyed this light choice for my dinner. 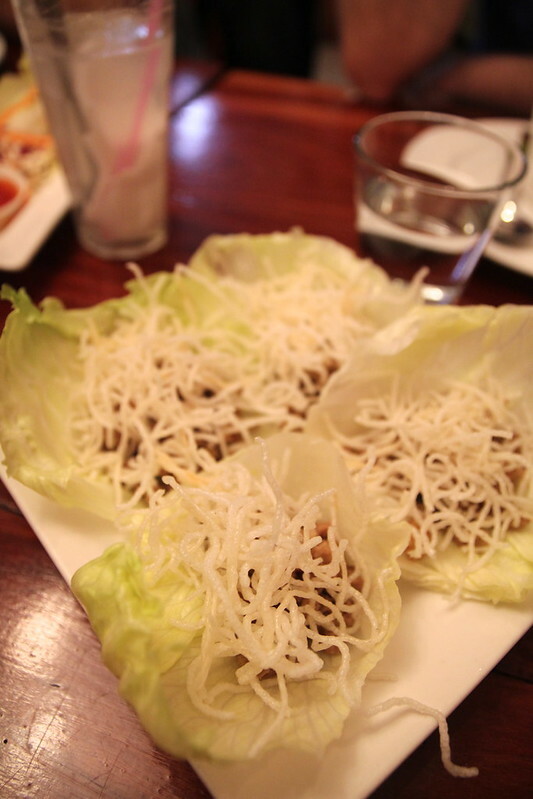 The chicken filling was very flavoursome and was accented well by the crispy rice noodles in the lettuce cup. If you’re after a light meal, this would be a good choice as it was surprisingly filling eaten solo! Crisp pastry surrounding curried veggies – this is a tough choice to go wrong with! The diner who chose this dish commented that the laksa was quite good quality with a hit of spice to it, but in general he prefers flavours of a Malaysian laksa to a Thai version, as it tends to feel more authentic. 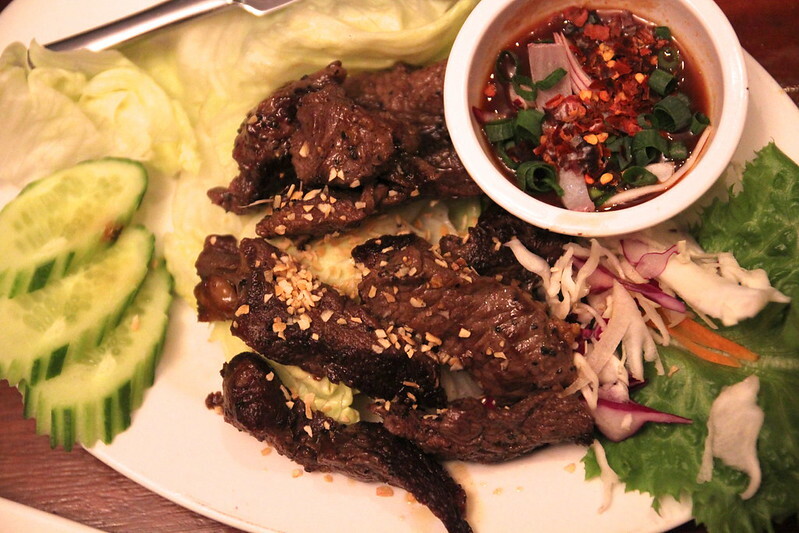 Tender slices of grilled beef marinated in Thai spices – this dish was a good pick of the evening. 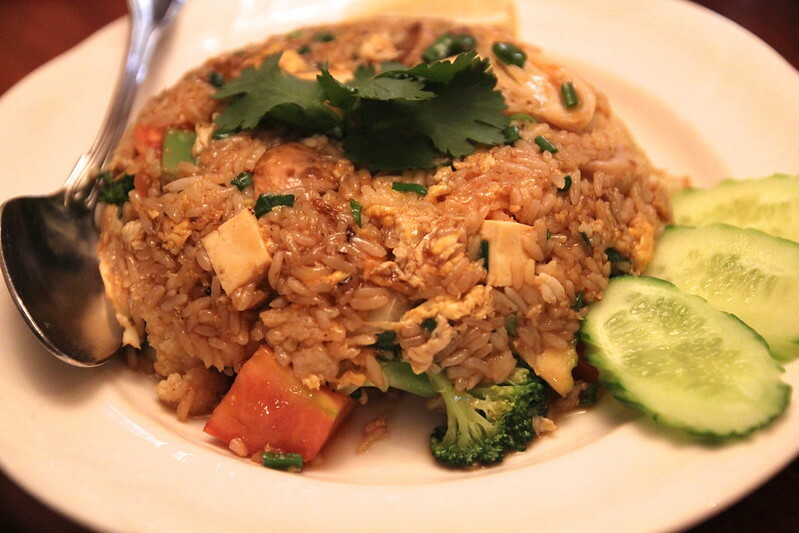 I sampled a spoonful of this fried rice and was surprised at the fantastic flavour that Thai Passion managed to bring out in such a simple dish. It had an almost saucy texture to the rice that made me seriously wish I had ordered this as well! Definitely would come back just to try this dish, as I have sampled many Thai fried rices over Sydney and really felt this one stood out of the crowd. There is a lot of stiff competition for Thai food in Newtown but I think that Thai Passion is definitely holding its own with good quality Thai food with great prices. Best dishes of the night were definitely the fried rice and the coconut juice. Service was friendly and helpful, which always makes a meal more enjoyable. We really enjoyed our meal and it’s definitely somewhere I would come again in future. It’s a short walk from Newtown station which is another plus for convenience. 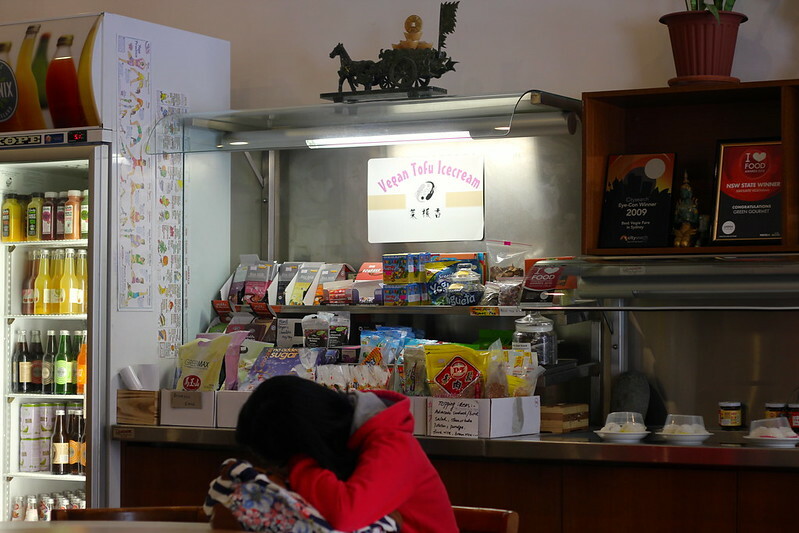 I also noted that they do $7.50 lunch specials which seem worth checking out (if only Newtown weren’t so far from my workplace!) Please note also (like many places), that they do not do split bills. 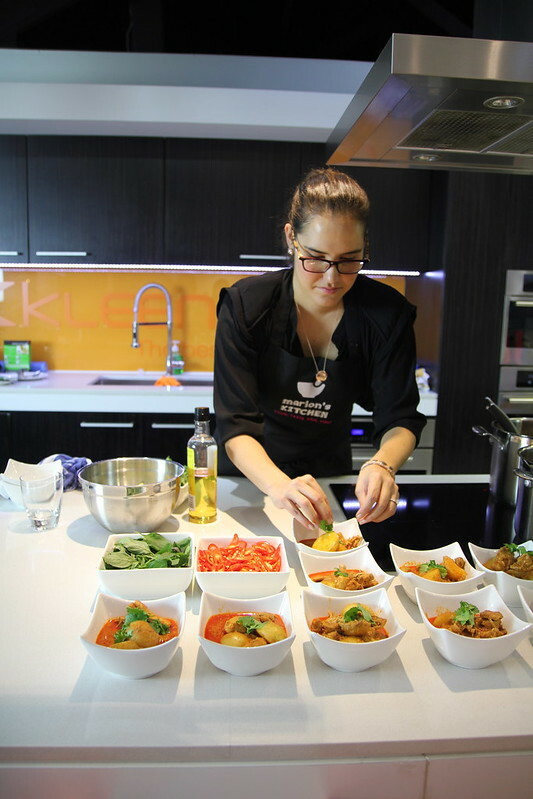 The other day I was fortunate enough to be invited along to taste the Marion Grasby range of products for easy, quick and delicious Thai meals at home. As if that weren’t enough, Marion would be cooking the meals herself! Since Marion and I both share a love of cooking and we both have south-east Asian mums and Aussie dads, I had a feeling she would definitely be someone I’d get along with! 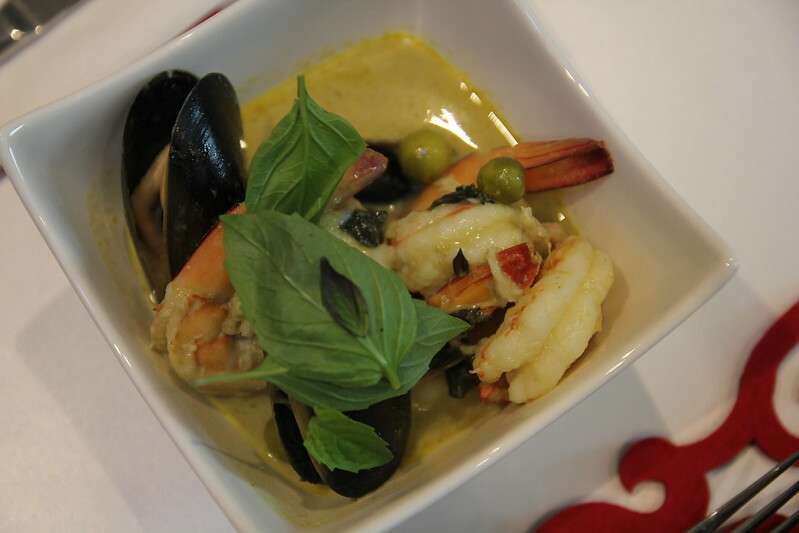 We started off with Marion’s most popular bestseller – her Thai green curry meal kit. After tasting it, I could see why! The sauce was incredibly rich and flavoursome. Even a spoonful of the sauce over some steamed rice was extremely satisfying. I must admit I do love green curries but I never usually go to the trouble of preparing them at home. 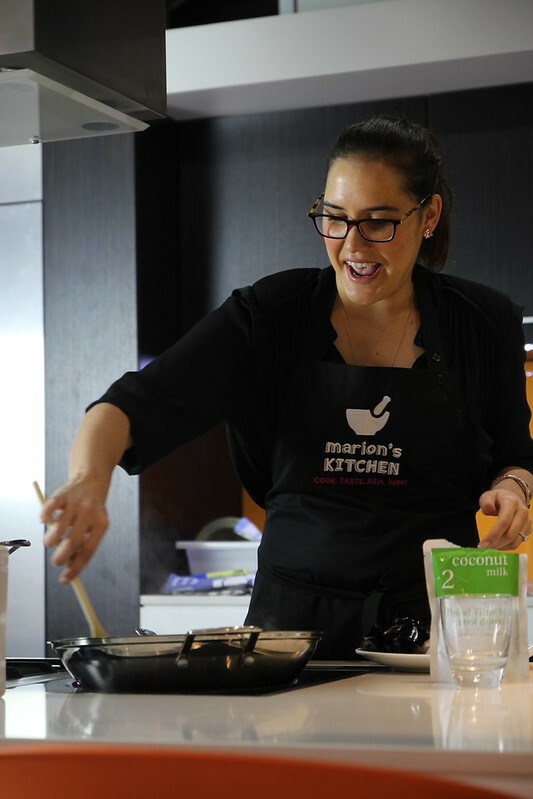 Marion’s curry kit makes it so much easier by providing not only the curry paste, but also the coconut milk, Thai herbs and chilli, fish sauce and bamboo shoots. Next up was Marion’s chicken and potato Malaysian curry, which is a new addition to her line of meal kits. I really enjoy a good chicken and potato curry and this one did not disappoint. I really loved the hearty, rich sauce of the curry, which really flavoured the chicken and potatoes well. If I had to make any (very small!) criticism, I would say I would have liked a touch more salt, but that’s something you could easily change to taste at home. If anything it’s probably better that it’s less salty to suit a wider range of tastes rather than too much. 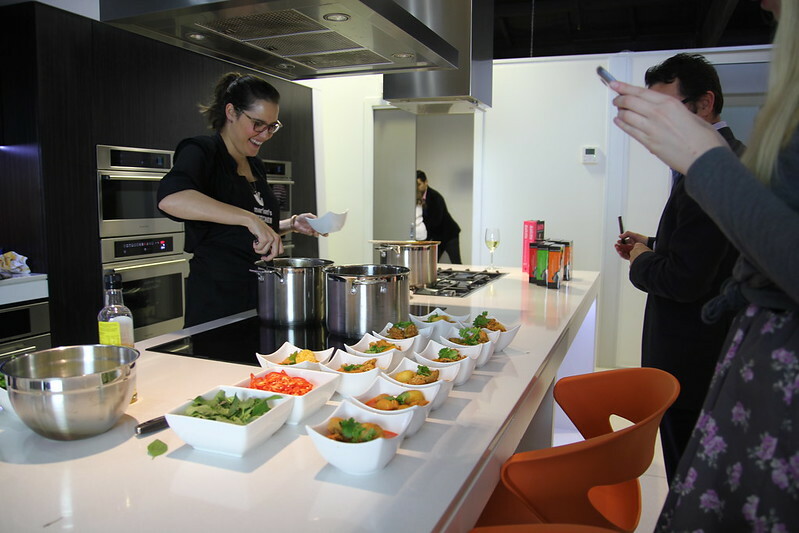 Last but not least was Marion’s red curry, which she paired with some fresh salmon fillets. I generally do not cook salmon fillets with curries at home (I usually bake them with spices, or with some kecap manis and garlic, which are my faves!) but after tasting Marion’s curry, I definitely need to branch out with my salmon dinners! 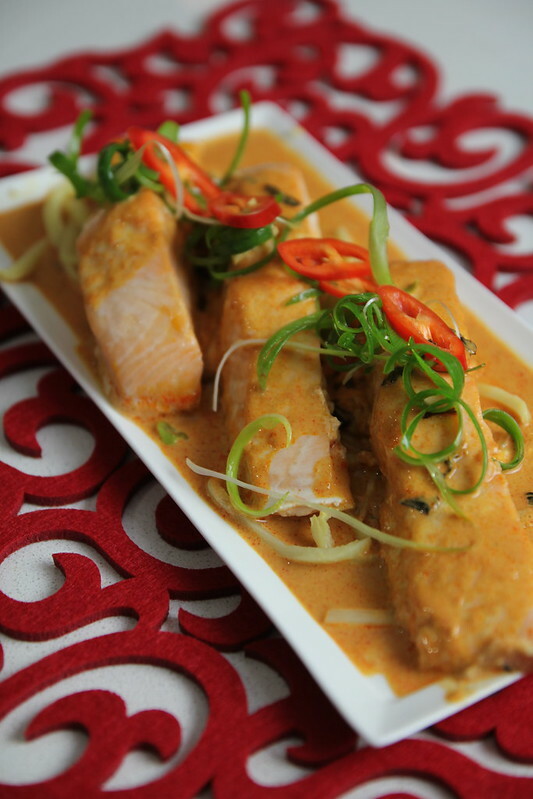 The salmon was cooked to perfection and was so buttery smooth with the rich red curry sauce. 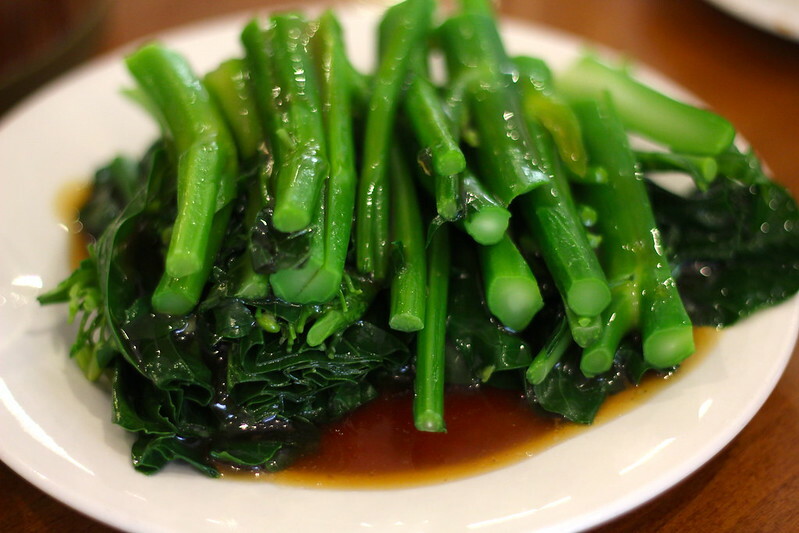 Definitely a great combination, especially with some freshly steamed rice! 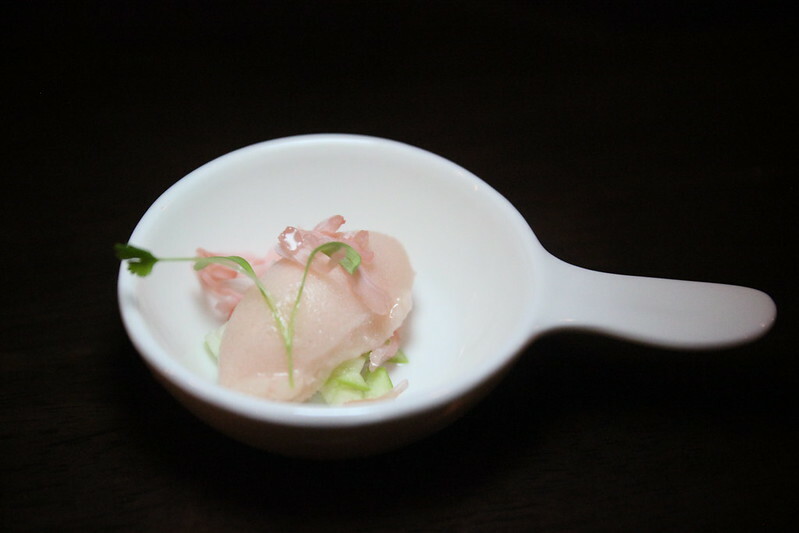 I also enjoyed the added kick of the sliced chillis and shallots which gave the dish an extra boost of flavour. I love how much these small additions can really punch up a dish. I was also lucky enough to do a short interview with Marion! Marion, you’ve just moved to Bangkok! 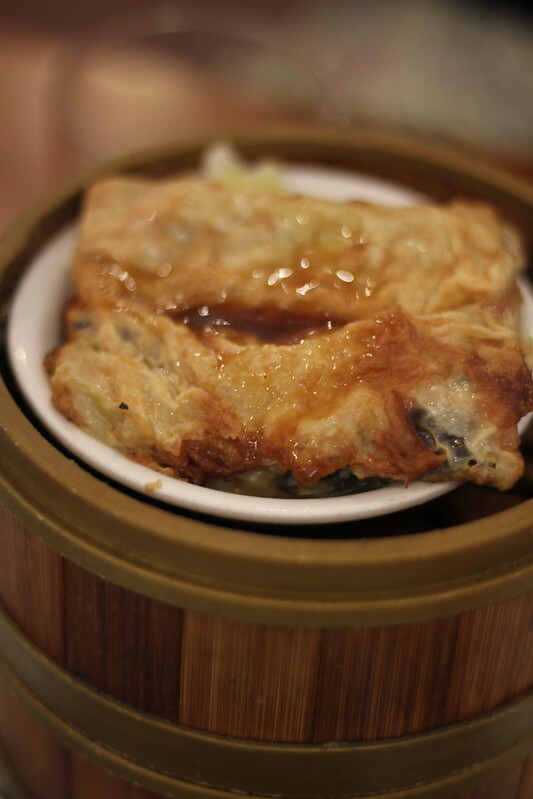 Do you have any favourite local dishes or restaurants you tend to frequent? We would love any recommendations you may have! Bangkok is such an amazing eating city! My favourite high end Thai restaurant is David Thompson’s Nahm. And for regional southern Thai food I love a homely little place called Khua Kling Pak Sod. 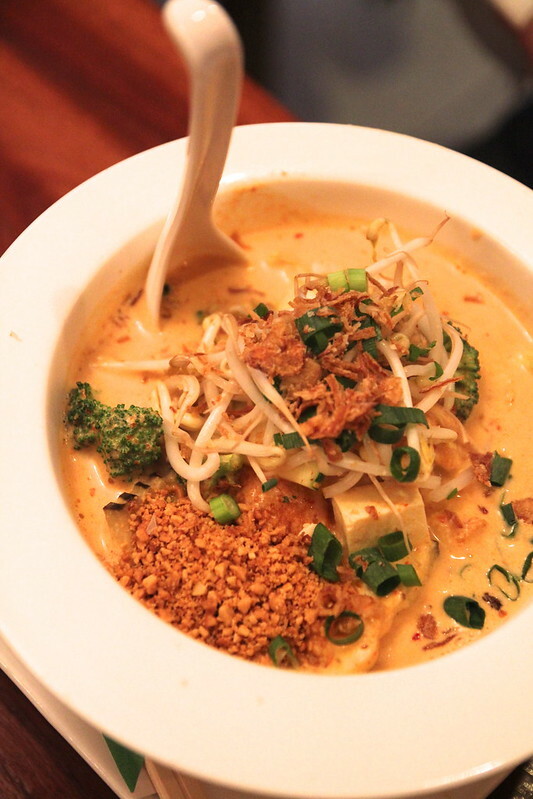 They make an amazing yellow curry but beware… it’s SUPER hot! I’m sure you have many fond childhood memories of favourite foods. We would love to hear about a favourite memory, or a funny food story from your childhood days. I can remember the first time my mum tried to make me eat durian. I nearly puked and cried for half an hour. Durian has the most offensive smell… but actually I’ve grown to like the taste now. Speaking of your childhood, did you have any personal heroes that inspired you to be the cook that you are today? My mum is my biggest inspiration. It’s thanks to her love of food and her Thai heritage that I have such a deep passion for Asian cooking. And she still teaches me stuff in the kitchen even now! 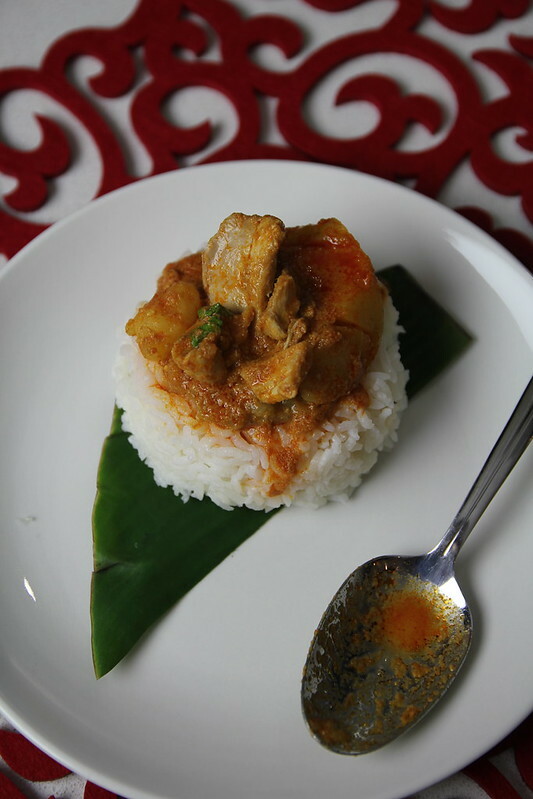 Aside from Thai food, what is your favourite cuisine to eat out at restaurants or make at home? At the moment I’m obsessed with Sri Lankan food. I would like to travel there this year but haven’t had the time, so I’ve been cooking Sri Lankan curries at home instead. What is your greatest food passion? My Marion’s Kitchen food range is now my biggest passion. I love traveling all over Asia finding amazing dishes to bring back to Australia for people to try. And I can’t believe that more than 150,000 people eat a Marion’s Kitchen dinner every month! Amazing! Tell us about your favourite kitchen gadget or tool. I can’t live without my traditional Thai mortar and pestle. What is your most favourite, decadent dessert (that you’ve eaten or made)? I once made Peter Gilmore’s 8-textured chocolate cake. It took me 10 hours and by the time I’d finished I’d tasted so many different chocolate layers that I didn’t even feel like eating it! What is the most difficult ingredient you’ve ever had to work with? Sea urchins! They’re so prickly! Masterchef opened a lot of doors for me but it was really only a starting point. The real work came afterwards when I set up my business, started writing cookbooks and worked on getting my own TV show. It really depends on what you want to do. If you want to be a working chef then an apprenticeship is a much better option. 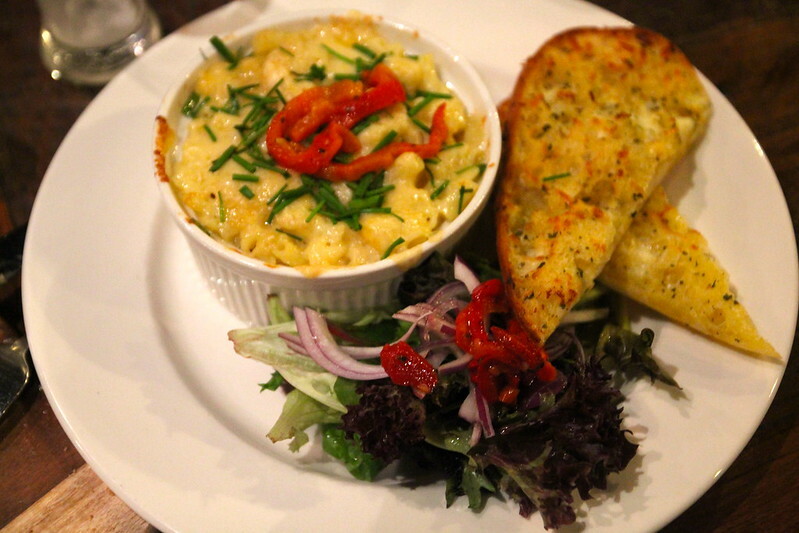 But if you want to write about food then starting a blog is an excellent way to get noticed. 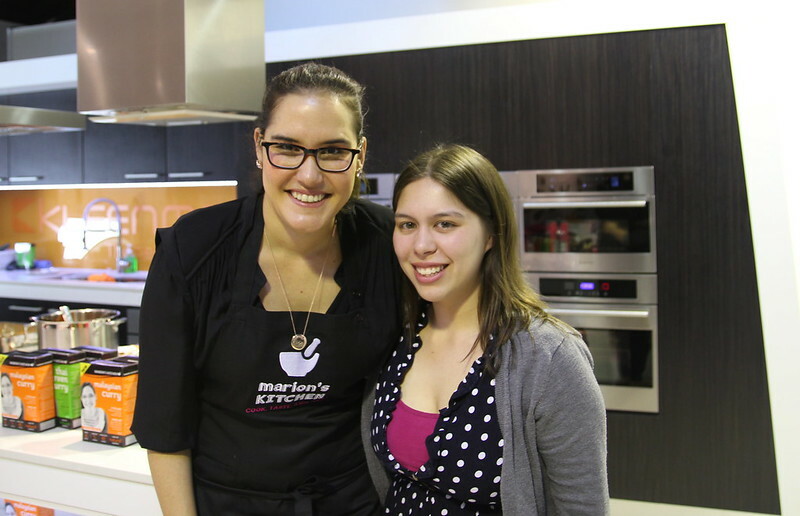 It was so great getting to meet the lovely and talented Marion Grasby and her at-home meal kits really are a credit to her. It was wonderful listening to her chat about her passion and love for learning more about her mum’s culture as well as her desire to bring the best and most authentic ingredients for her products so that her customers are getting the best at-home experience possible. Thanks so much for a delicious lunch and taking the time to interview for us, Marion! I bet there are plenty of those who would empathise with your initial reaction to durian, although I must admit that I also really enjoy it myself (I’m glad I’m not alone)! Thanks also to Magnum PR for inviting me to this fun event! A recent girly weekend away to the Hunter Valley with some food blogger pals resulted in a hunt for somewhere special for dinner. Chanel from Cats Love Cooking suggested Muse Restaurant (where she held her wedding reception no less!) and off we went to share a truly memorably dinner. 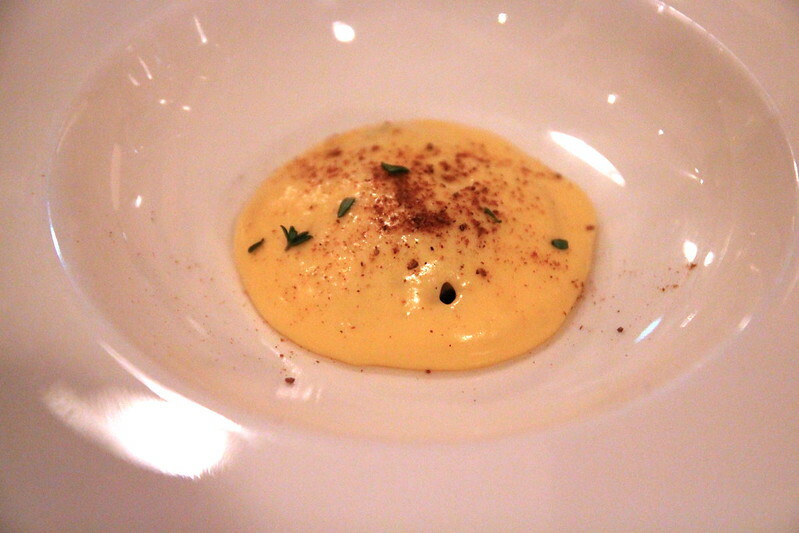 Amuse bouche for the evening, parmesan custard with mushroom duxelles, thyme and porcini dust. 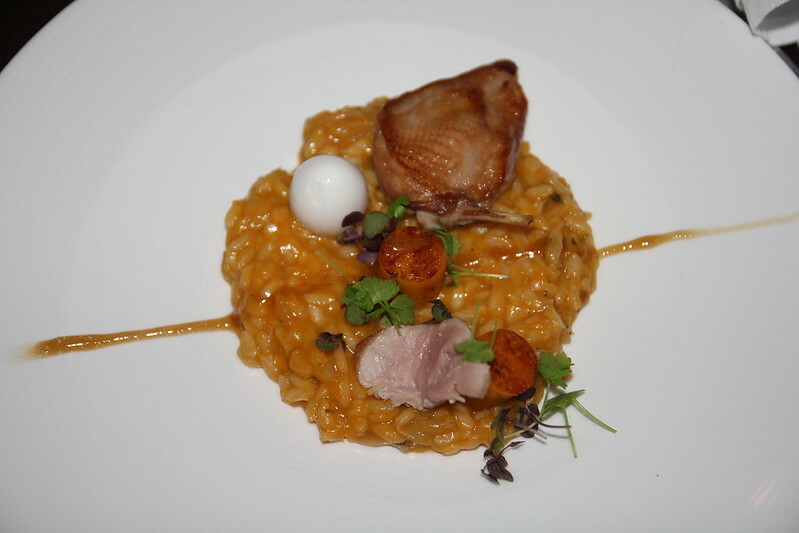 Red Gate Farm Quail with Pumpkin Risotto, pure maple, bleu de basque and a soft boiled quail egg. There were some pretty good things on my entree plate on this evening! The stand-out element was definitely the quail’s breast. It was seasoned really well and was cooked to perfection. My accompanying quail’s egg had a perfect runny yolk which made a lovely rich sauce to dip the breast in. Definitely a good start to the meal and was surprisingly large for an entree size, not that I was complaining ;). Beetroot with binnorie goats cheese, coppersfolly wasabi, buttered king brown mushrooms. 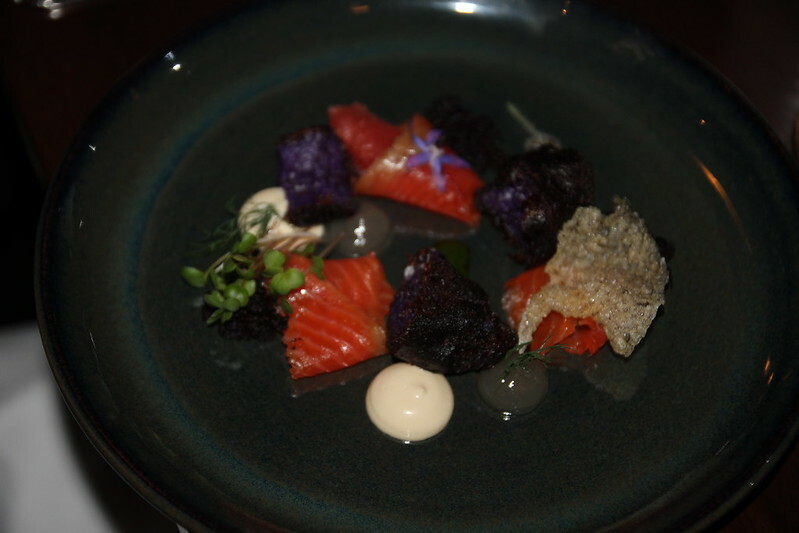 Cured Ocean Trout with congo potato, olive, bacon aioli, grapefruit and dill. Palate cleanser, ruby grapefruit sorbet with fresh apple and baby coriander. This palate cleanser was a lovely little freshener between courses. The ruby grapefruit flavours went really well with the crrrunch of the freshly diced apple. I especially loved the addition of the baby coriander which gave it a lovely kick. 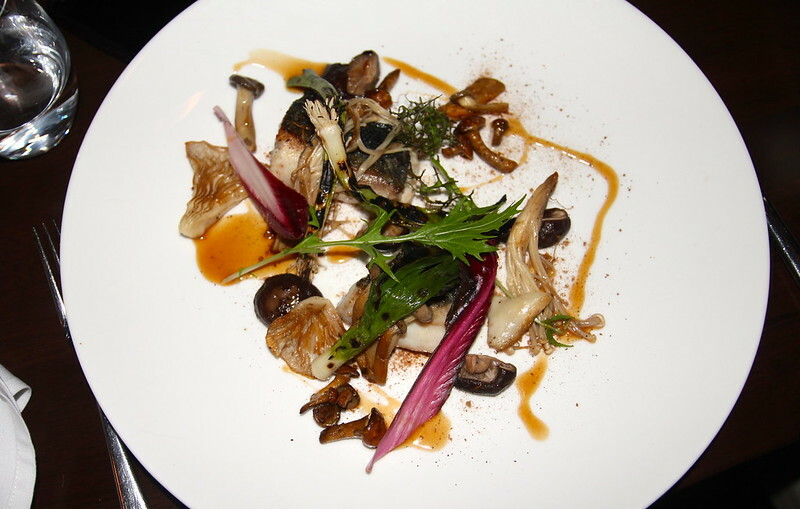 Blue Eye Trevalla with buttered mushrooms, pencil leek, miso dressing, mizuna. This was my main for the evening and I absolutely loved it. Two tender, perfectly cooked fish fillets (honestly is there anything better than a piece of damn well-cooked fish??) that were sooo silky and just melted in your mouth. The fish was accompanied with a good handful of incredibly flavoursome mixed mushrooms and finished with a sweet miso sauce which matched everything on the plate so beautifully. 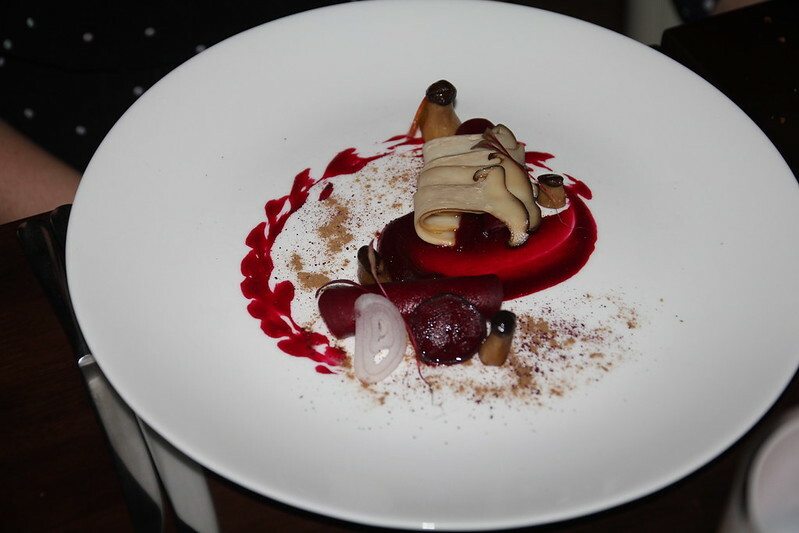 An incredibly memorable dish that I would order again and again. Don’t be deceived by the photo – this was actually an incredibly large main, even though it looks small in the photo. This is because of the way it spread out on the plate – which was incredibly massive. Biggest plate I’ve eaten off, haha. It was actually so filling I very sadly failed to completely finish my second fish fillet – but this should just let you know how large the entree and mains I had were! We also added side dishes, which I really enjoyed, but I don’t think were necessary as my meal was so big! 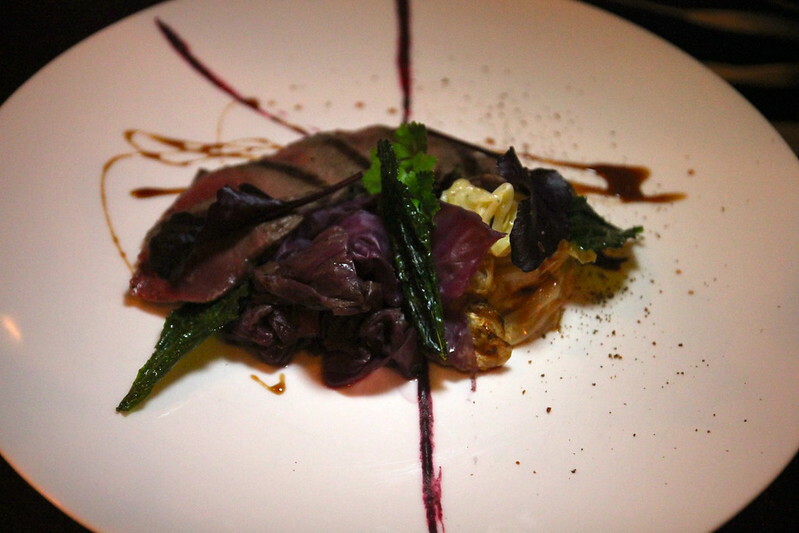 Mandagery Creek Venison smoked in Barrel Shavings with white, red and black cabbage, blackberry, juniper and pedro ximenez. 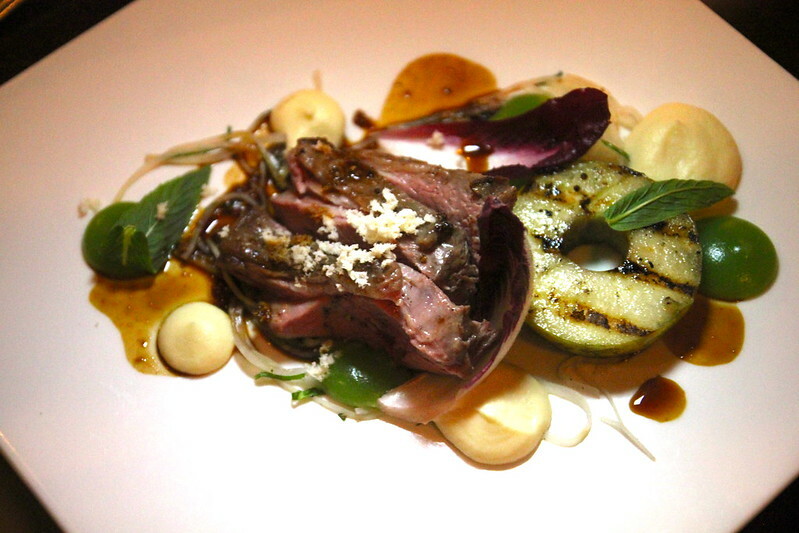 Slow cooked Milly Hill lamb with celeriac, charred apple, mint, horseradish and jus. 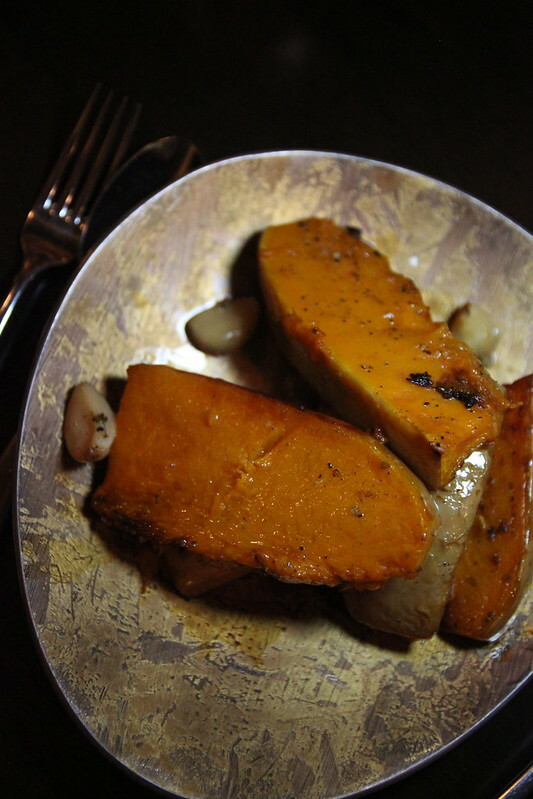 Side dish of roasted butternut pumpkin. 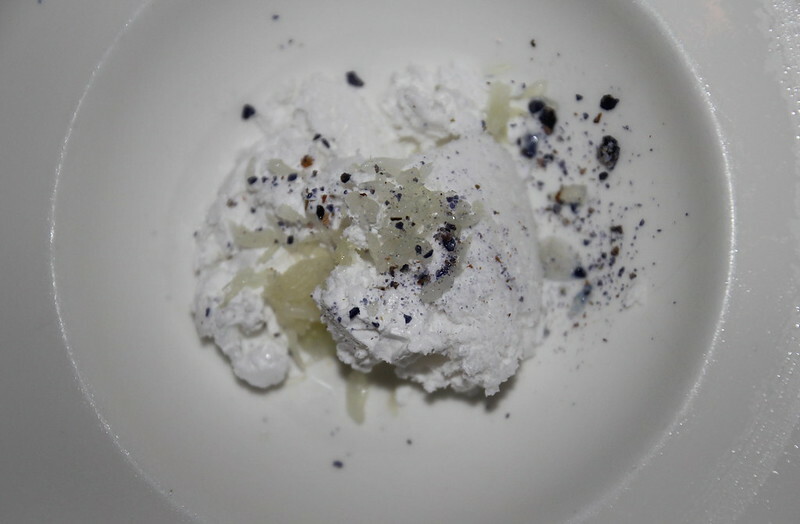 Pre-dessert for the night: Coconut cloud (coconut cream with a simple sugar syrup, aerated and then frozen) with crushed candied violets and lime. OH MY GOODNESS I wish this was on the dessert menu! 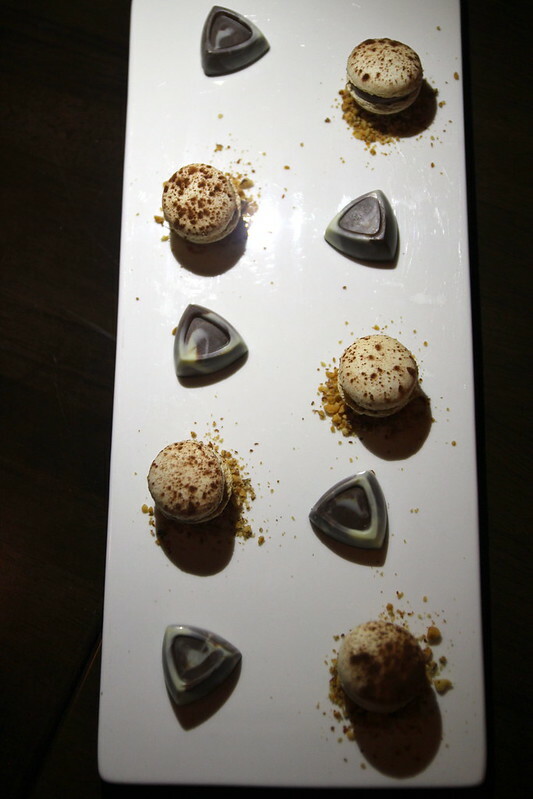 We absolutely loved it – light and coconut creamy goodness paired with lime and crushed candied violet. Incredible. 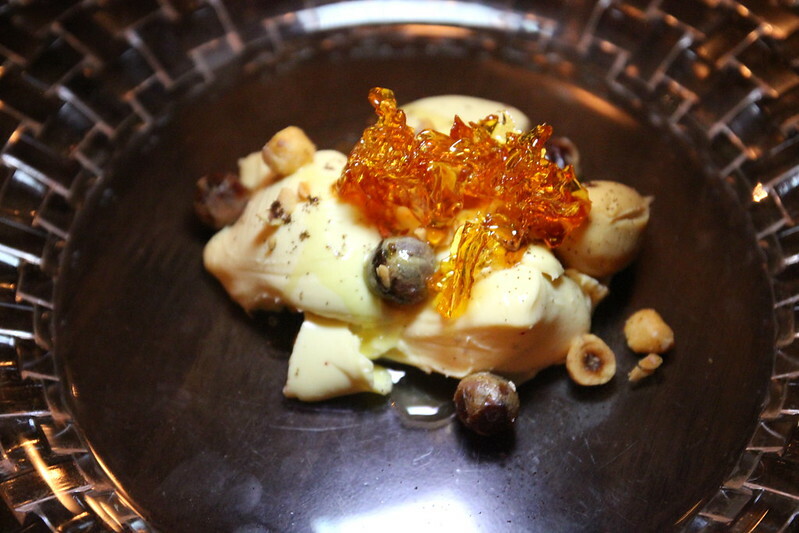 Deconstructed Vanilla Crème Brûlée with caramelised white chocolate, salted date, hazelnut, coffee and brown butter. I just loved the gorgeous presentation of this dish, especially the lovely glass plate it was plated on, which had such a pretty border. 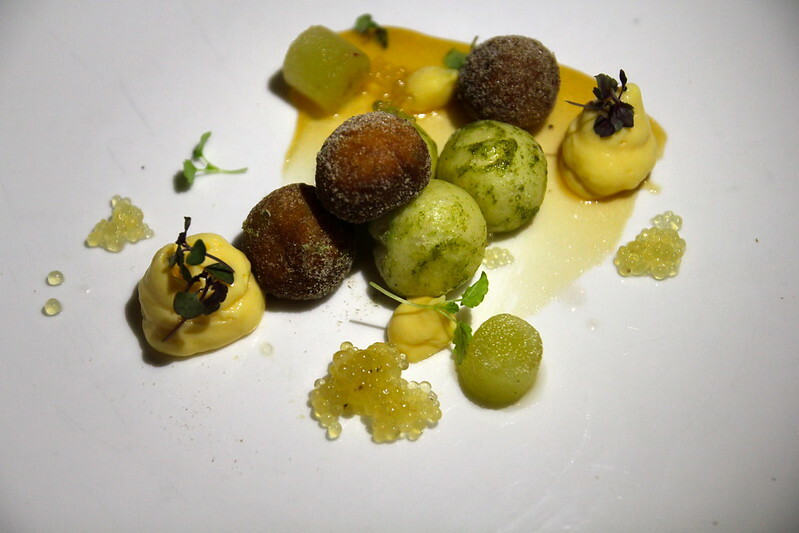 Chai and Matcha tea doughnuts with apple, binnorie quark custard and vanilla. 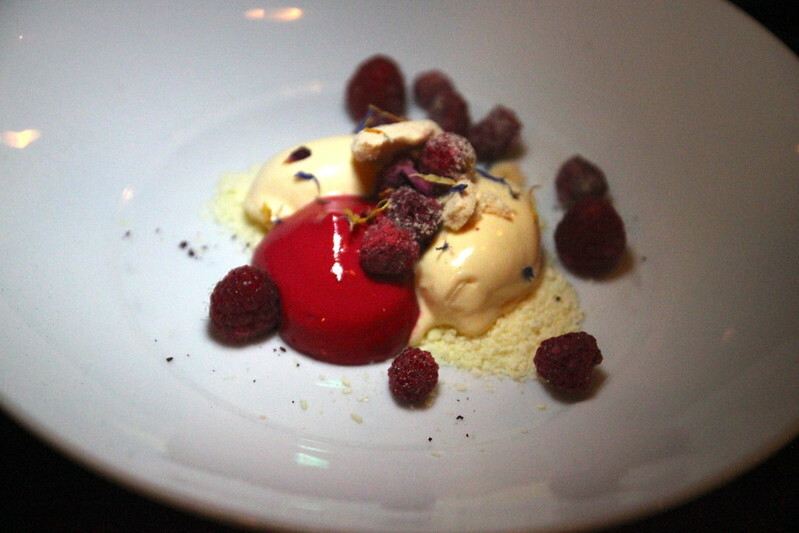 Nitro White Chocolate Ice Cream and Raspberries, whipped, fresh, dehydrated. 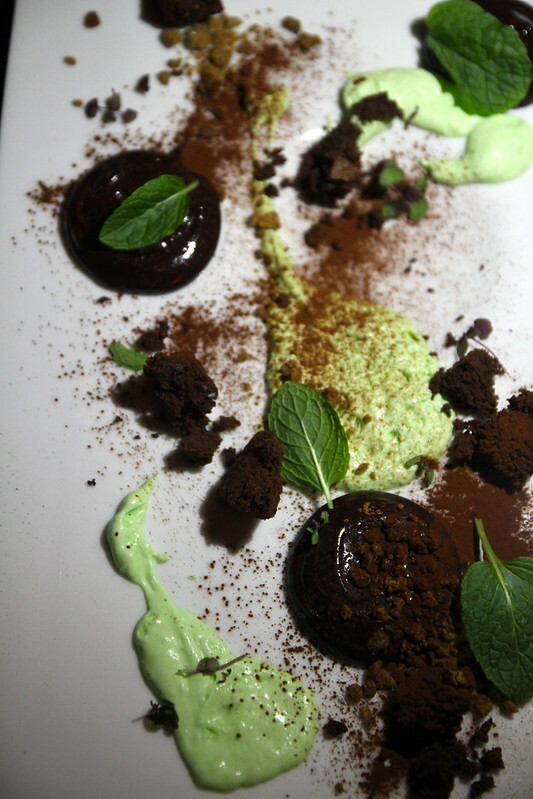 Warm dark chocolate mousse, minted cream, gingerbread, torte and shiso. I had a spoonful of this chocolate mousse and minty cream and it was riiiich. The mint cream was a good balance for it but I think it also would have been nice with a creamier but less sweet element to balance it more. This would be a good dessert to share between two people because it’s so rich. The gingerbread also gave this dessert a nice textural element. Petit fours, chocolate macarons and salted caramel chocolates. It had been awhile since I’ve had a meal this fancy and this really reminded me how much I enjoy fine dining. There’s something about the ambience, the great service and of course the sublime food that is such an enjoyable and special experience. Special thanks goes to Chanel from Cats Love Cooking for introducing me to such a wonderful restaurant and JJ from 84th and 3rd for helping light food photos in the swanky romantic lighting of Muse Restaurant with the aid of an iPhone! 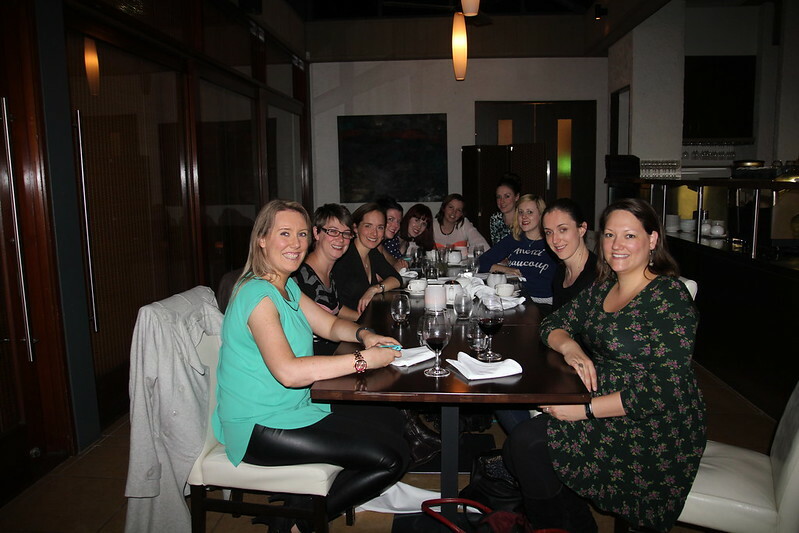 This weekend I was lucky enough to spend time away some with lovely food bloggers for my first trip to the Hunter Valley and we ended up at Brickworks Brasserie for a quick dinner. 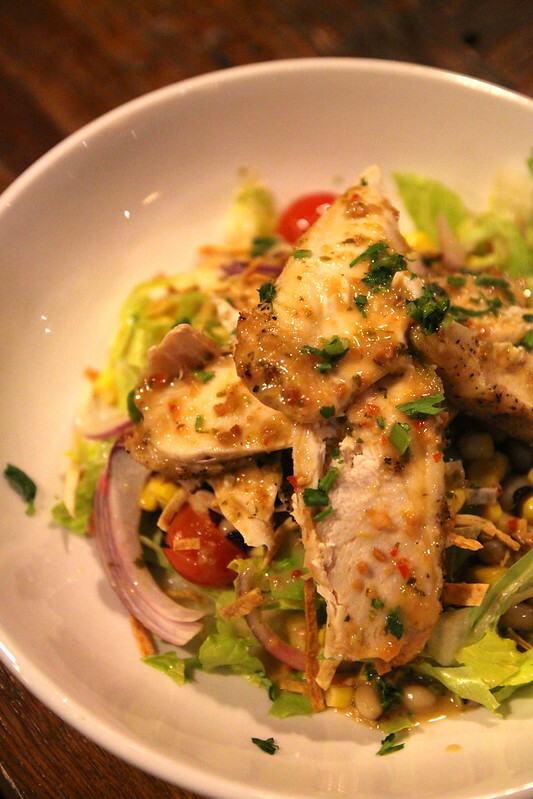 Gotta say that this is one of my favourite salads I’ve ever had from a pub – texturally and flavourwise it has so much good stuff going on and the spicy peanut coriander dressing was ridiculously good! 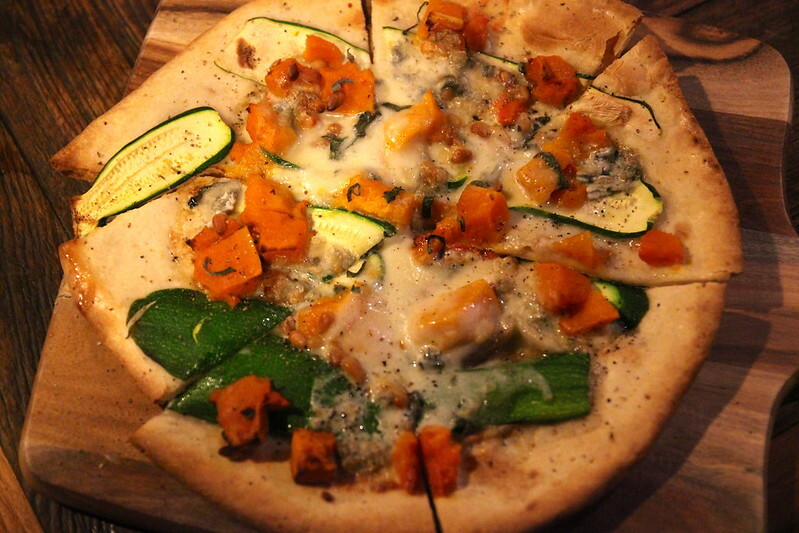 Vegetarian pizza ; Pumpkin, gorgonzola, sage and pine nut pizza. 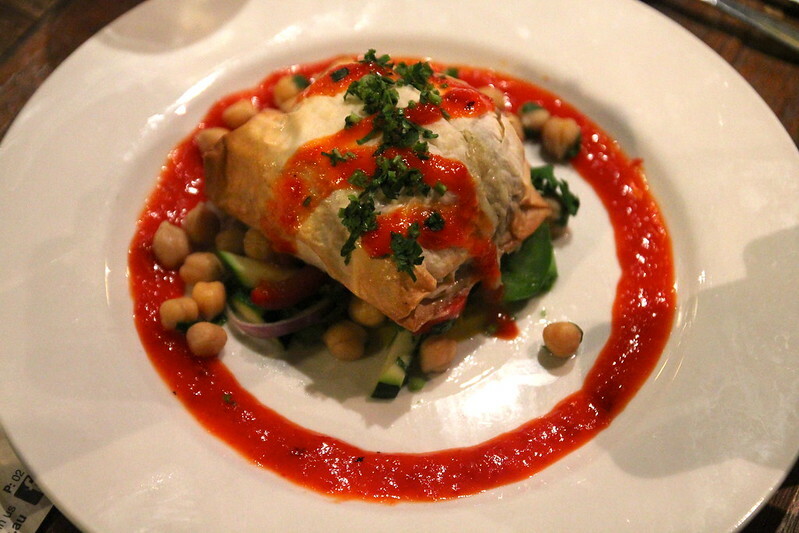 Mushroom filo ; Fetta and pine nut stuffed mushroom, baked in filo pastry with zucchini and chickpea salad with capsicum dressing. 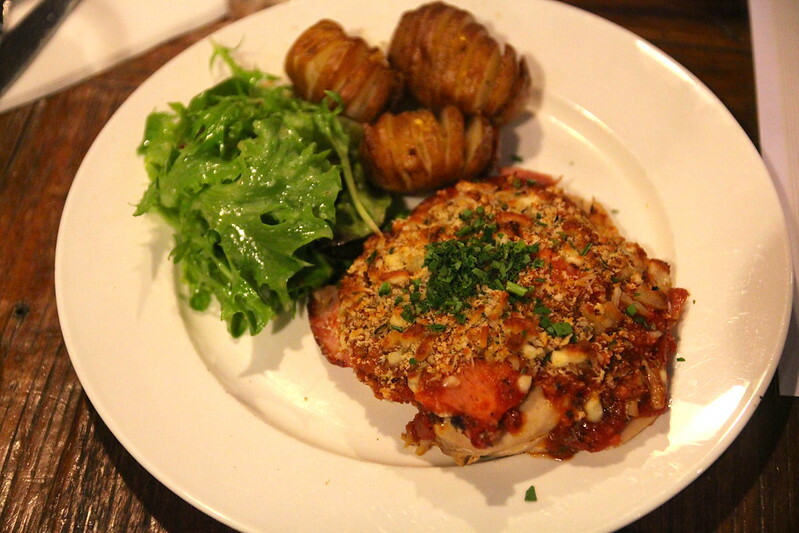 Chicken Parm, ; Chicken, ham, napoli sauce, parmesan and herb crumbs with a garden salad and razorback potatoes. Mac and four-cheese with bacon. There was plenty of parking available (handy for travelling in groups) and it’s a great place for a drink before or after dinner as well. 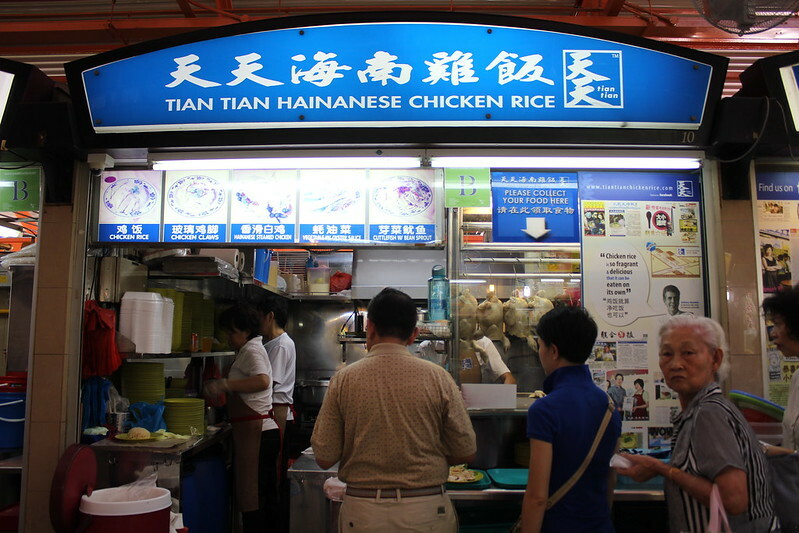 On planning my recent trip away to Singapore and Japan, I was happy to see a post on ChopinandmySaucepan’s food blog detailing a recent experience at Tian Tian Hainanese Chicken Rice in Singapore. Having only visited there once on a layover as a child, I was happy to put something so delicious-looking on my must-eat list. Plus, with Anthony Bourdain touting Tian Tian as his favourite spot to eat Hainanese chicken, I didn’t really need much more convincing. 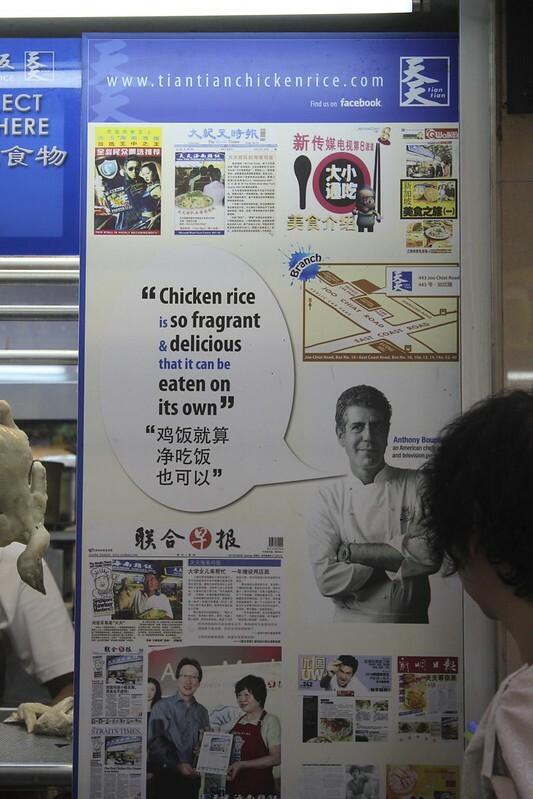 (vid above) Anthony Bourdain enjoying Hainanese chicken rice at Tian Tian. Admittedly I had very little experience with Hainanese chicken rice in Sydney. I remember first ordering it in Chatswood at an Asian food court and was somewhat disappointed. The rice was bland and flavourless, the chicken dried out and nothing special at all. I couldn’t really see what all the fuss was about and so did not ever bother to order a second time. 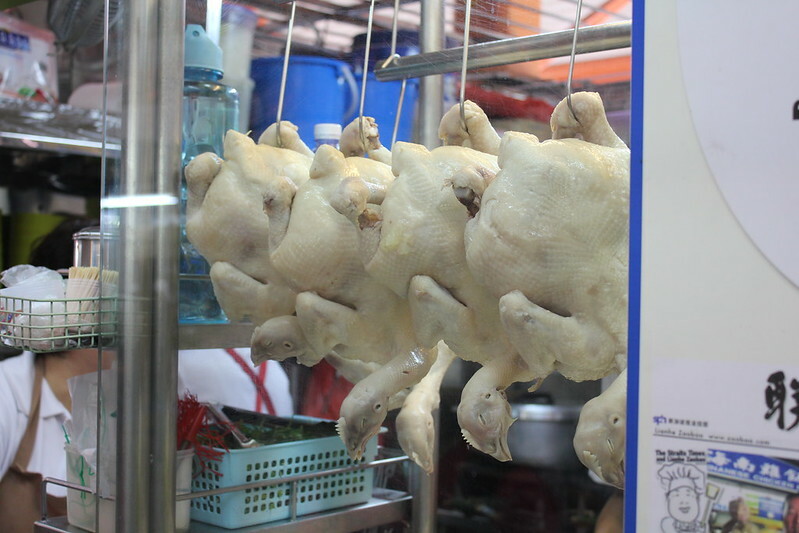 However, upon glancing upon Chopinand’s blog post about Tian Tian – I was immediately entranced by the glossy, gorgeously moist looking photos of luscious looking chicken and from that I was convinced that I had to give Hainanese chicken a second try. 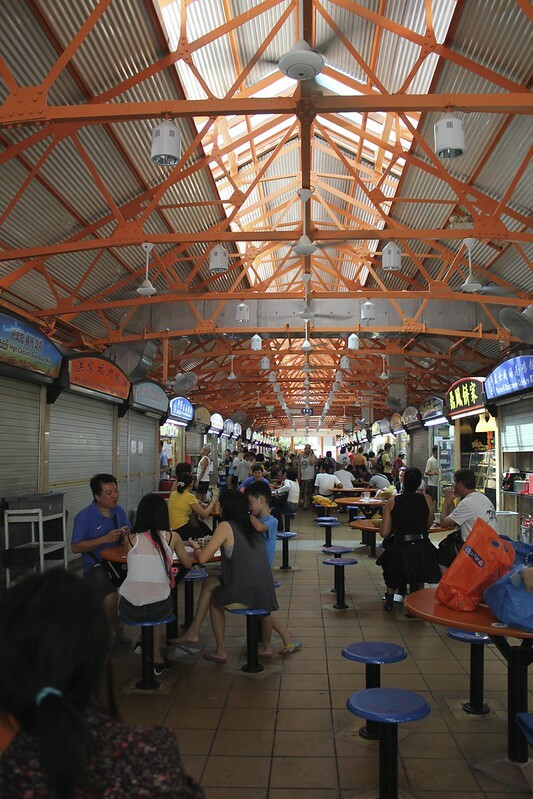 One of the reasons I was so excited to visit Singapore is because of its insane cleanliness. As a kid, my mum put the fear of God into me about street food (which everyone knows is the best stuff!) and so I was never allowed to sample any on our family trips to the Philippines (much to my disappointment). Even now as an adult, I hear my mum’s voice echoing every time I have the opportunity to sample some tasty but potentially dodgy-looking street food while travelling. 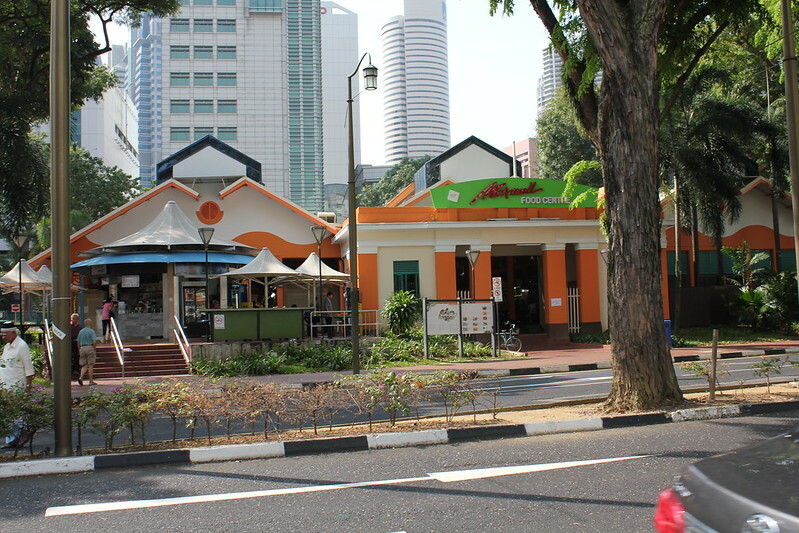 Fortunately Singapore solves this issue by displaying mandated signs pretty much everywhere food is served, which lets you know what sort of grade (A, B, C or D) their establishment has received from their National Environment Agency. You can’t really get much more reassuring than that. Plus the fact that everywhere in Singapore is so unbelievably spick and span makes me think that their kitchens have just as high a standard of cleanliness. So given this, Singapore is pretty much my dream destination – my one opportunity to safely gorge myself on as much cheap and delicious street food as possible! 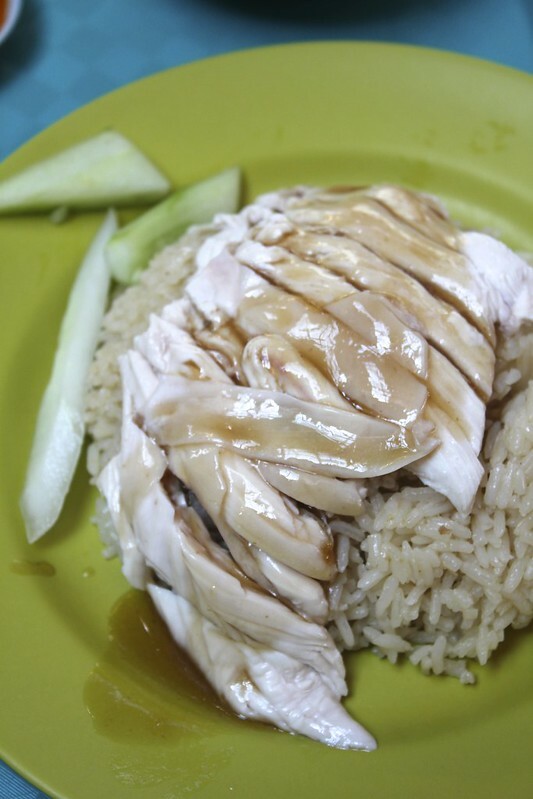 Hainanese Chicken Rice, $3.50 SGD. Comes with their famous chilli sauce and dark soy sauce and a bowl of chicken broth (not pictured). 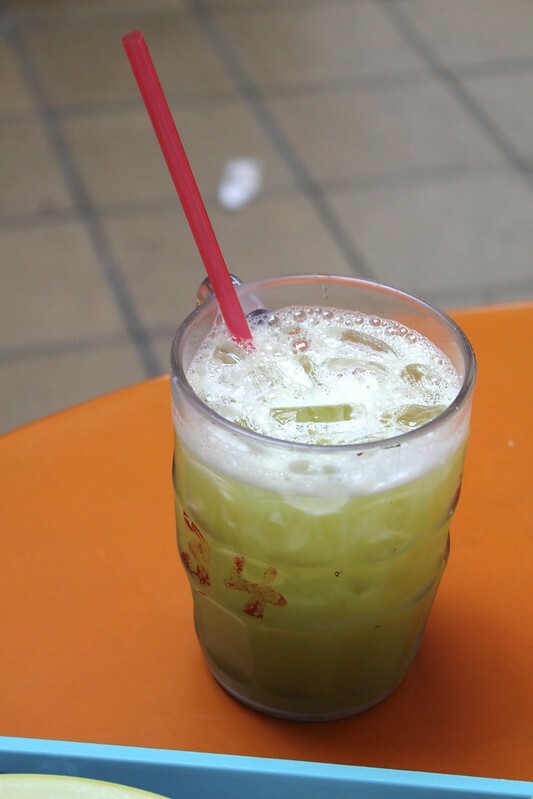 Why not grab a frosty glass of sugar cane juice? Tian Tian’s Hainanese chicken was without a doubt the best chicken rice I have ever had (including several other restaurants we sampled whilst in Singapore). 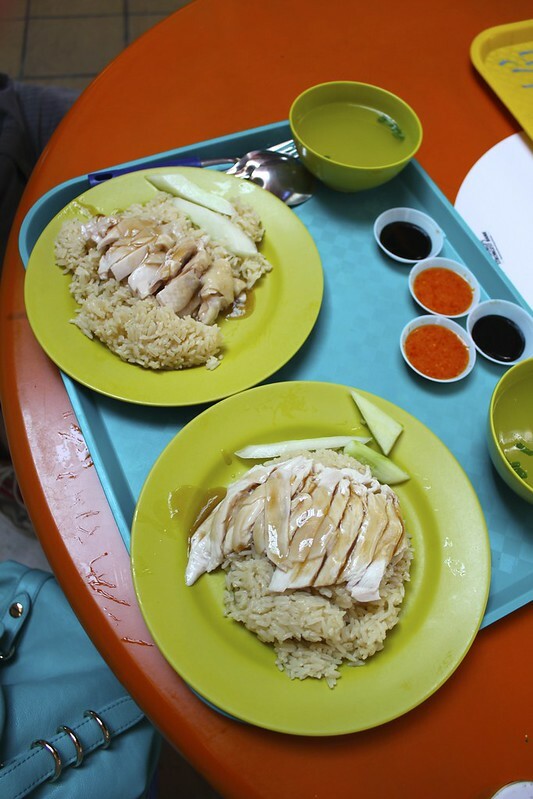 The chicken was so unbelievably packed with moist, juicy flavour and the chicken rice was incredibly good. There were plenty of sauces and condiments to add to the dish, but it was SO good that I ate about 3/4 of it before I even remembered they came with it – and to be honest it didn’t really need it. It just tasted so damned good by itself. With a price of $3.50 SGD per plate, it’s almost embarrassingly cheap (especially for Sydney-siders!). For chicken this good, I would expect to pay three to five times the amount in Sydney, should anyone ever master Hainanese chicken the way they have at Tian Tian. It’s a shame that I only visited Singapore for three days. Had I stayed for longer, or come to the Maxwell Food Centre earlier, I definitely would have visited Tian Tian on more than one occasion! I definitely will be looking for my Hainanese chicken fix in Sydney. Here begins the quest to find something that’s nearly as good as Tian Tian’s! Ever since my recent gluten and dairy free stint, I must admit there have been a few foods that I have been missing. Cheese is definitely one. Buttery, delicious pastries have been another! Creamy mushroom fettuccine (be still my beating heart!) has been another as well as white chocolate, butter and supermarket iced coffees. I will admit that this diet has definitely forced me to be a lot healthier but I am surprisingly enjoying it. While I do enjoy healthy food, its quite often that the lazy side of me will choose unhealthier options out of convenience and price – especially for my unplanned work lunches which have recently transformed from Chinese fried chicken takeaways, chips and creamy pastas to roast chicken salads to tuna, tomatoes and herbs on gluten free crispbreads, lots of fruit and loads more veggies. Since I chose such unhealthy options so frequently in the past its almost surprising how much I enjoy the change and I do hope it’s a habit that sticks. It’s also fun coming up with healthier versions of things I normally cook as its surprising how delicious the results often are. All that aside – I must say that it’s definitely nice to have a treat now and then and one thing I definitely miss is brownies. When I first started baking, brownies were my go-to recipe and I loved making super naughty versions of them (my faves had cookie dough swirled into the brownie batter with a thick layer of chocolate ganache. heartstoppingly amazing!) So while fruit has been my latest go-to dessert, sometimes you just want to sink your teeth into something soft, dense and amazingly chocolatey – which led me to go searching for gluten free brownie mixes. I found this one at Woolworths for $4.99 and thought I’d give it a shot. Coles also sell a similar mix, but for a different brand which I’d be interested in giving a try. The box mix says to add 2 eggs and 1/2 a cup of melted butter, but I substituted the butter for 1/2 a cup of rice bran oil to make it dairy free and couldn’t taste a difference. In fact it was a bit more convenient as I didn’t need to melt any butter. The box mix also includes some chocolate chips which it says to melt with the butter to mix into the batter, but I skipped this and just added them to the batter for some extra texture which I think turned out really well and did not detract from the chocolatey flavour of the brownie batter overall. So the verdict? I found these brownies to be an excellent substitute for regular brownies. They were very moist, dense and chocolatey. I particularly enjoyed the chocolate chips in the batter rather than melted, but that’s just a personal preference. 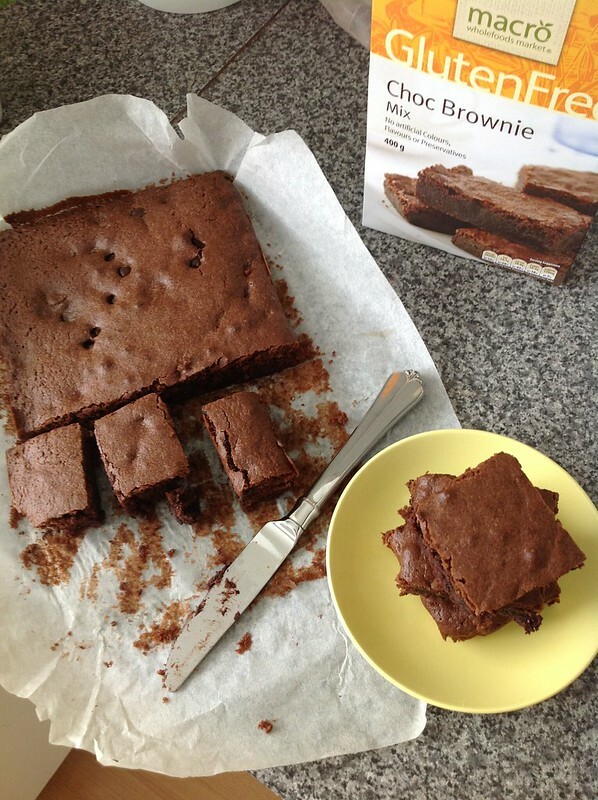 I found it hard to find a difference in taste or texture to regular box mix brownies that normally contain gluten/dairy. They were also very easy to make (just mix together eggs, oil and ingredients in the box and bake – too easy!). I imagine the ingredients are something like a mixture of corn/rice flour, sugar and cocoa powder so would probably be quite easy to put together yourself with a good recipe, as well as cheaper – but generally buying a box mix for the convenient factor usually adds a bit to the price. If they were on sale, I’d definitely snag another box but for full price, I don’t expect it’s something I’d buy regularly. In terms of taste and texture though, I would give it a 4/5. After sampling a few brownies, I froze the rest of the batch to prevent me from eating it all… Until I discovered that frozen brownies taste amazing. (If you haven’t already, you have to try it! 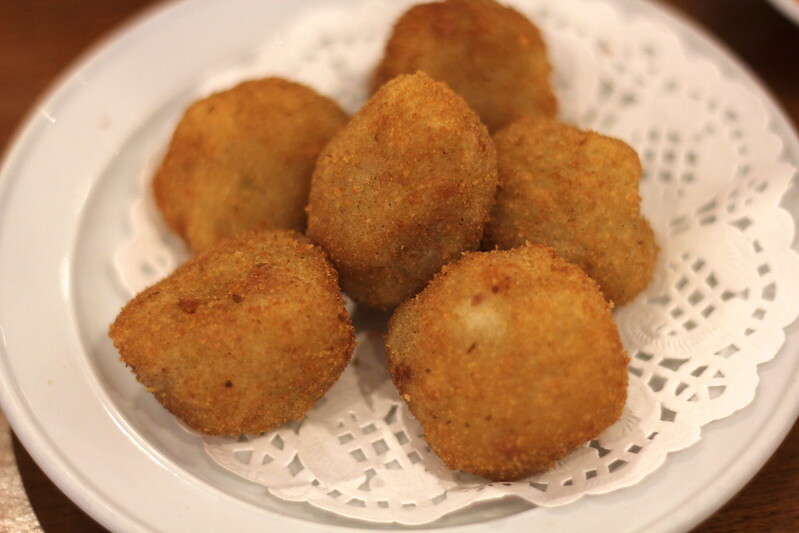 They get denser and almost taste richer – if that’s possible?) You could also microwave them for a warmer brownie if that’s what you prefer, but I bet you will find these very handy for when you need a quick sugar fix! So how about you readers? 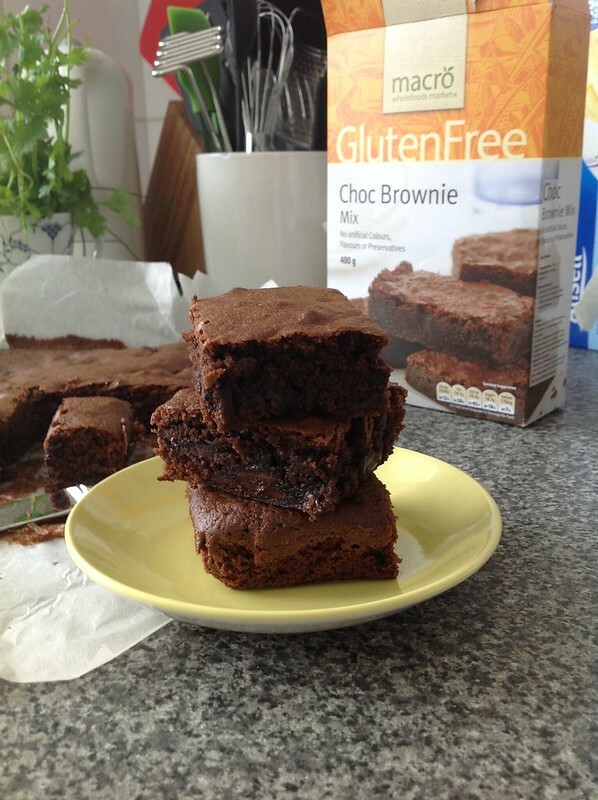 Would you consider trying gluten/dairy free brownies or do you prefer to stick with the real deal? *This has not been a paid review. Cooking Crusade paid for the box mix/ingredients. 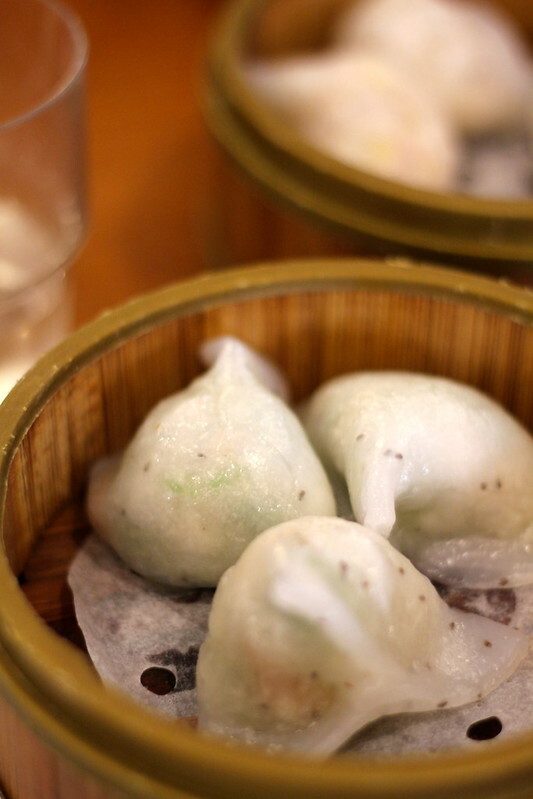 I’ve been meaning to visit Green Gourmet for their yum cha for some time now. I’m a huge fan of their restaurant and have visited many times for dinner as it’s the perfect place to go with vegan or vegetarian friends, but if I’m to be completely honest with you, their food is so good that I often go by myself or con my meat-eating friends into going and 9/10 times, they are never disappointed — you will not miss the meat at all! Well enough of my banging on and let’s get to the important part — the food! 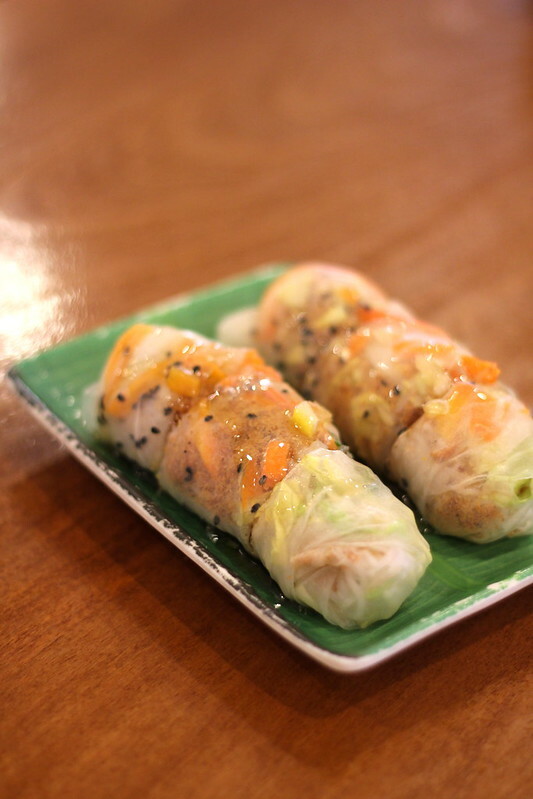 Vegan rice paper roll – Vietnamese rice paper, seaweed tofu, lettuce, pickled carrot and turnip and crumbed soy protein. 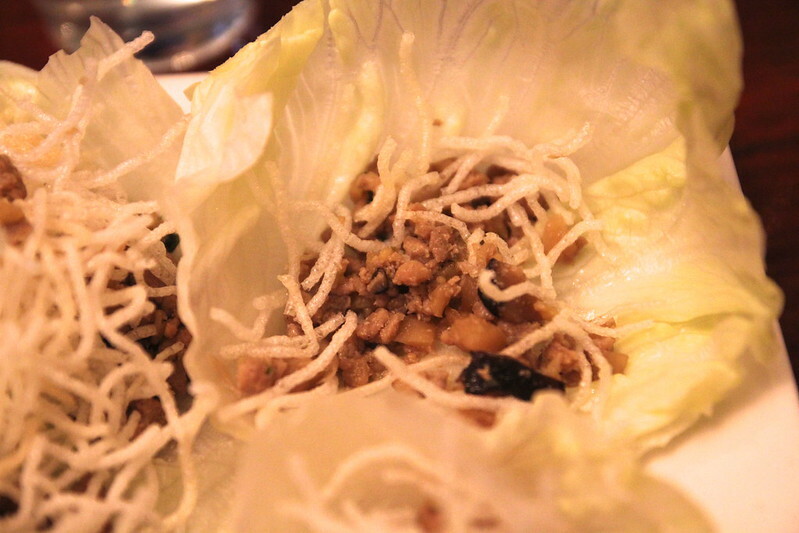 I loved the freshness of the crunchy veggies and the vermicelli noodles with the sweet sauce. I need to learn to make these at home! These reminded me of those KFC deep fried potato ‘mashies’ I used to be obsessed about until they stopped making them (probably a good thing lol) but slightly softer. Just wow. 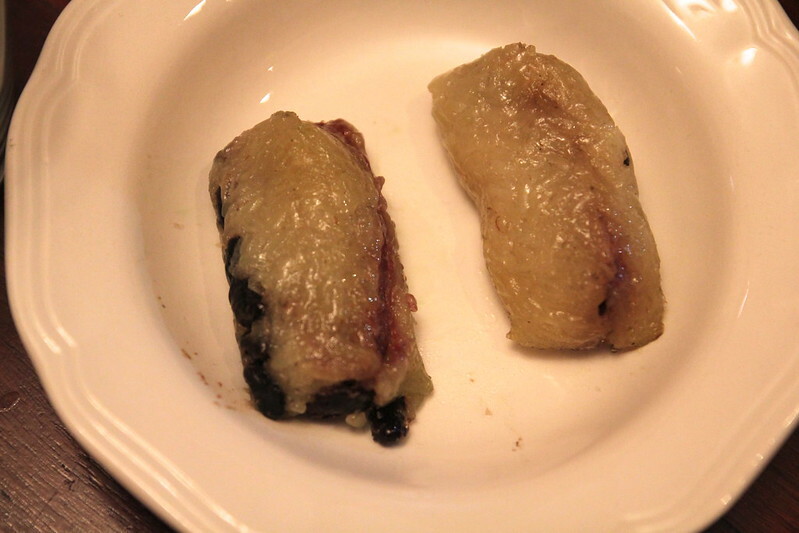 The mushrooms were soo juicy and delicious and who knew they tasted so good with nori? Oh the fact that they were deep fried probably helped too, heh. 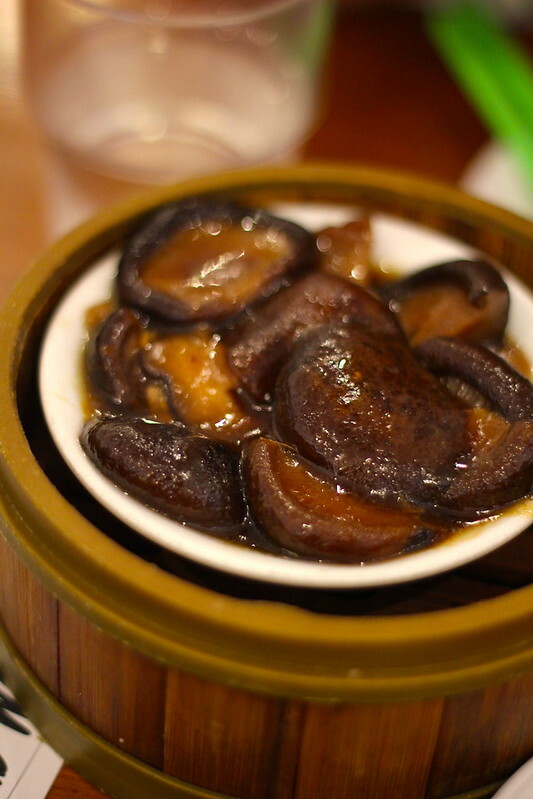 I kept sneaking bites of these amazingly flavoursome mushies in a savoury sauce. One of my old faves — these did not disappoint! I couldn’t get over how much they tasted like real prawn gow gees. 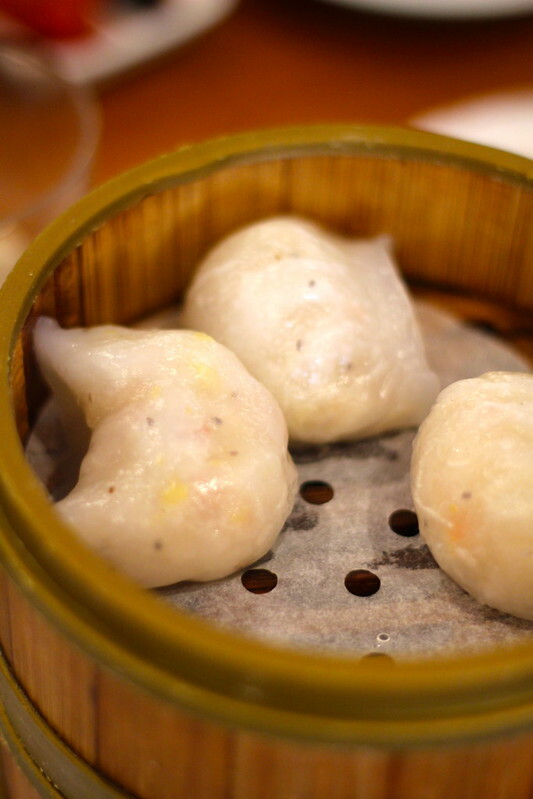 Another old fave of mine, I used to order these at yum cha regularly. I really enjoyed the contrast between the thinly sliced tender veggies and the chewy thin tofu wraps. Soooo good. 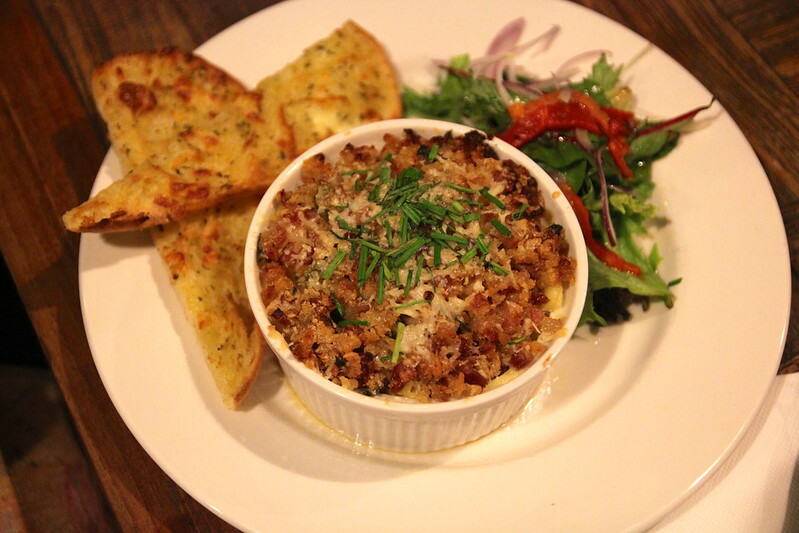 This was a popular dish and did not take long for us to finish! Love that moreish char siu sauce, and this had a very similar texture to meat. Who could say no to this one? I’ve been known to polish off whole plates of this myself before. I think I saw JJ’s eyes light up when she saw this one hehe. 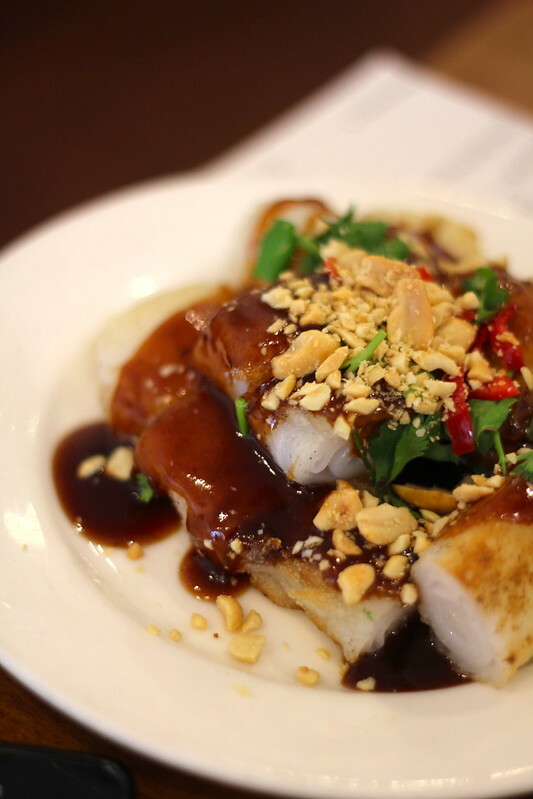 One of my absolute faves – cheong fun – crispy fried rice noodles topped with a peanutty hoisin sauce, crushed peanuts, chilli and coriander — such an amazing blend of flavours. Another one I would love to learn how to make at home! 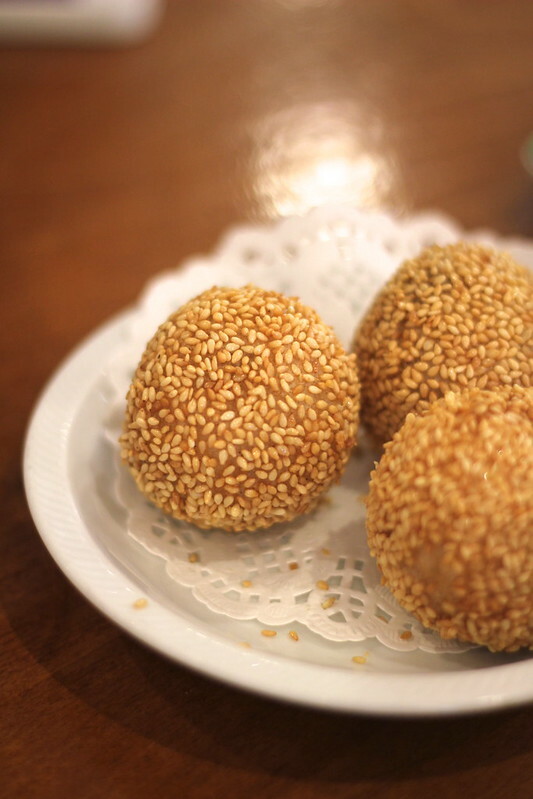 Sweet sesame red bean paste balls. 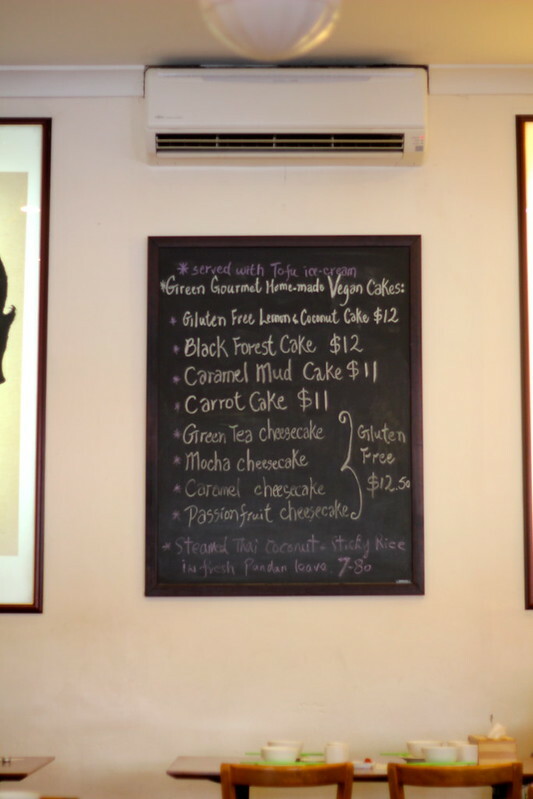 Green Gourmet also serve a tempting array of decadent sweets — just look at this list! And all of them completely vegan — good news for vegans with a sweet tooth! A bunch of delicious vegan treats for sale as well! 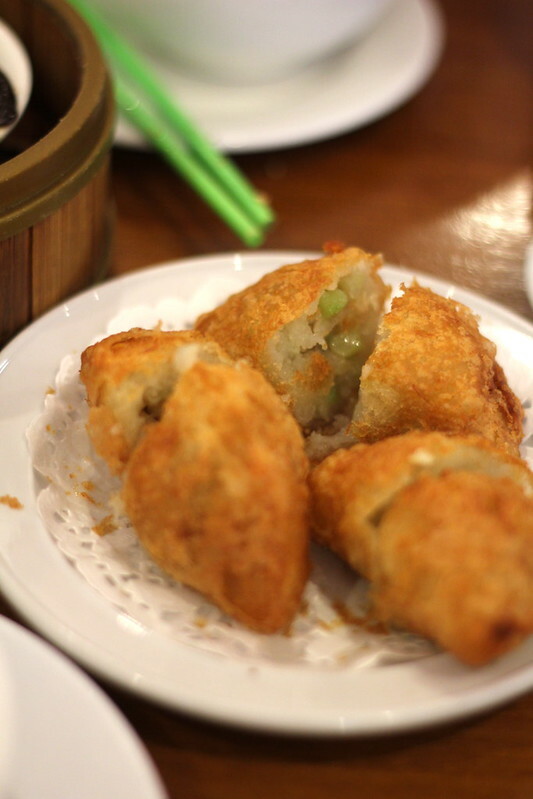 My fave dishes from this outing were definitely the fried cheong fun rice noodles with hoisin sauce and coriander, the vegetarian spring rolls (with the thin tofu) and… all of the steamed dumplings. Oh and the shiitake mushrooms. 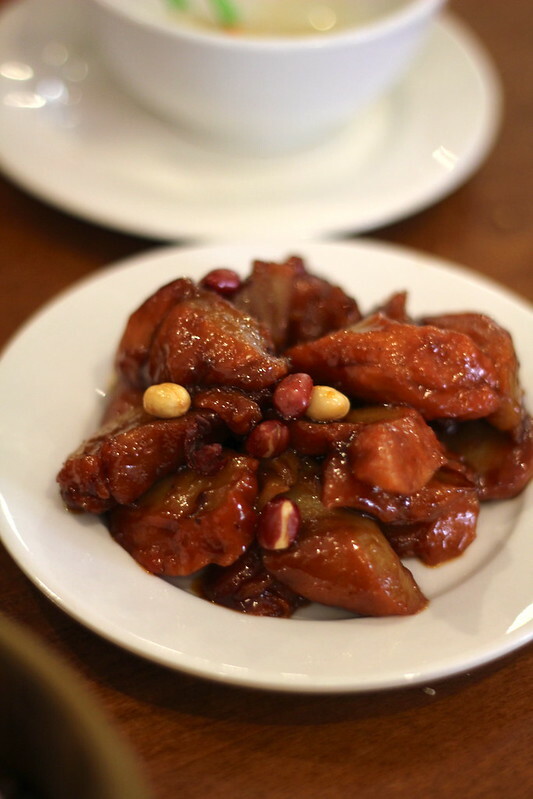 And char siu ‘pork’… Need I go on? If it didn’t get any better, their yum cha presents fabulous value. The five of us ordered so many dishes and yet it came to a tiny $14 each. Unbelievable value! One last bonus of Green Gourmet is that it’s next door to Vegan’s Choice Grocery (post to come!) — an amazing shop packed full of goodies a vegan dreams about, as well as all kinds of cakes, slices, the BEST brownies I’ve ever eaten (GF, DF AND egg free to boot!) as well as a tasty selection of homemade tofu ice-creams. Honestly, I challenge you to go in there and NOT spend a packet of money. It’s too hard, I tell you! Hope you’re all enjoying the cooler weather. I don’t know about you guys but I’m seriously over this ‘heat-wave’ bizzo. At least we all have the long weekend to look forward too, woohoo! For months, my workmates and I salivated in anticipation over the giant poster hung over a shop window announcing that frozen yoghurt would soon be a treat available in Epping. 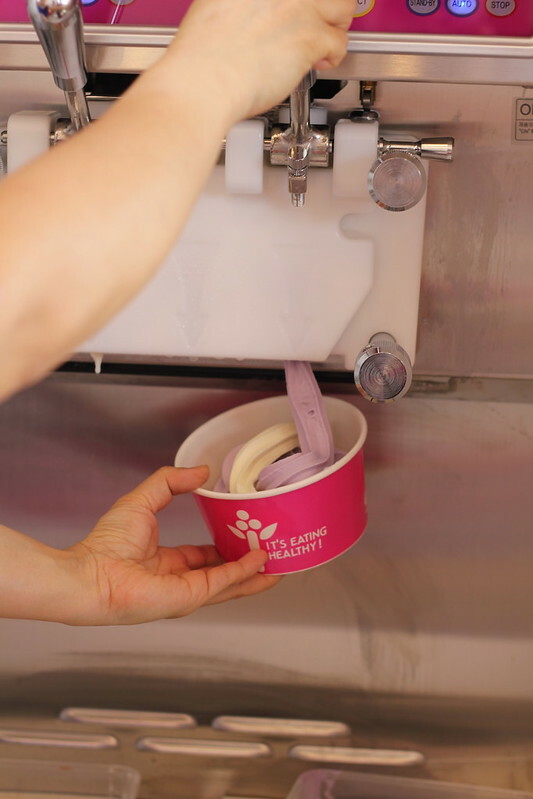 Coffee runs would soon be changed to froyo runs. Sipping hot liquids at my desk would become a thing of the past, instead replaced by gloriously creamy froyo in different flavours. Expectations were raised higher and higher, and complaints of “WHY isn’t it open yet? ?” grew more frequent. 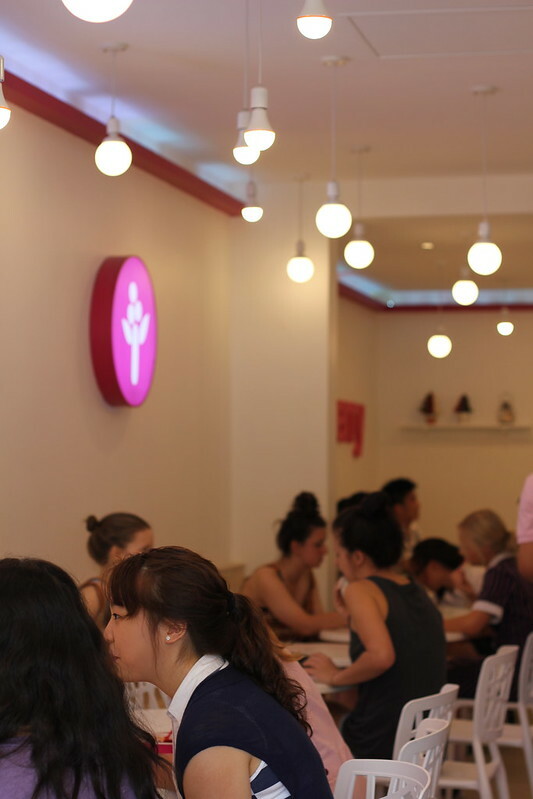 It all dissipated in a moment of shock and joy when, passing by Hothis for lunch, I realised Yogurberry. Was finally. Open. The first thing I did was call my workmate who had also been eyeing off the signs to screech “IT’S OPEN, IT’S FINALLY OPEN” and after lunch, finally descended on the magic that is Yogurberry. And as high as my expectations were, it did not disappoint. They had an opening special of 50% off for a couple of days. 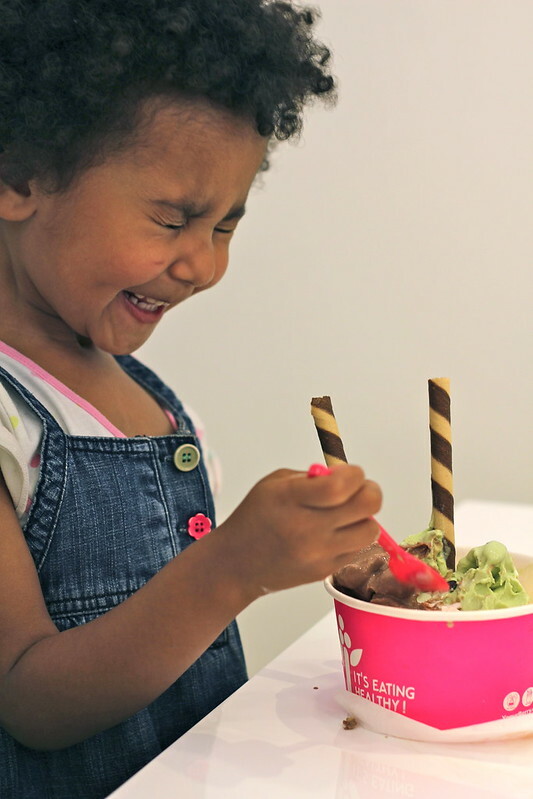 Half-price froyo, how can you go wrong? Unless of course the froyo is cursed. Or contains potassium benzoate. Sorry, that’s a bad Simpsons joke. I stood in line and picked out the smallest cup (which, by the way, is hilariously large). The thing I love the most about Yogurberry is that you pay by weight instead of by size. That means that I can get a GIANT serving if I want, or if I’m feeling a tad full from lunch, I can get a miniscule serving if I want. ALSO, I can get as many toppings as I want without worrying about a giant surcharge per topping as with normal ice cream / froyo places. So I basically have no reason to never get froyo! 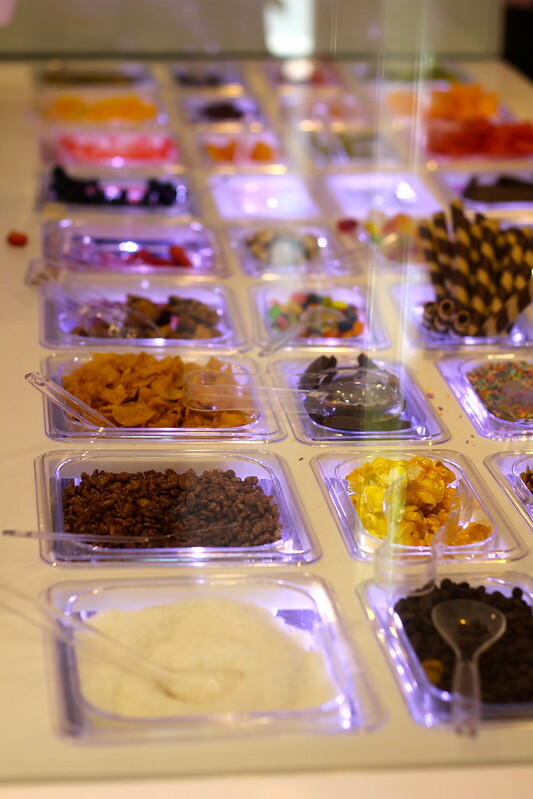 This is my perfect froyo dream! So many toppings! They had everything from cocoa pops, corn flakes, shredded coconut, candied popcorn, chocolate chips, sprinkles, tim tams and a whole lot of fresh fruits and of course, pearls. 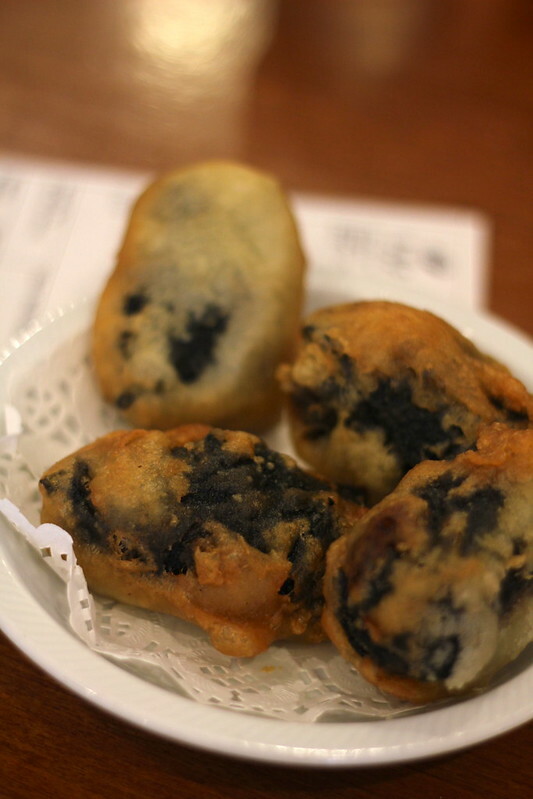 Since each serving varies in price (I believe its about 10c per 20g), a regular serving is about $5-6.00. This serving above was quite huge so cost about $8-9.00. Of course, I had to try each flavour on my first go! And since it’s self serve, this was easy enough to do. My flavour preferences in order are taro, strawberry, plain, green tea, chocolate and mango. 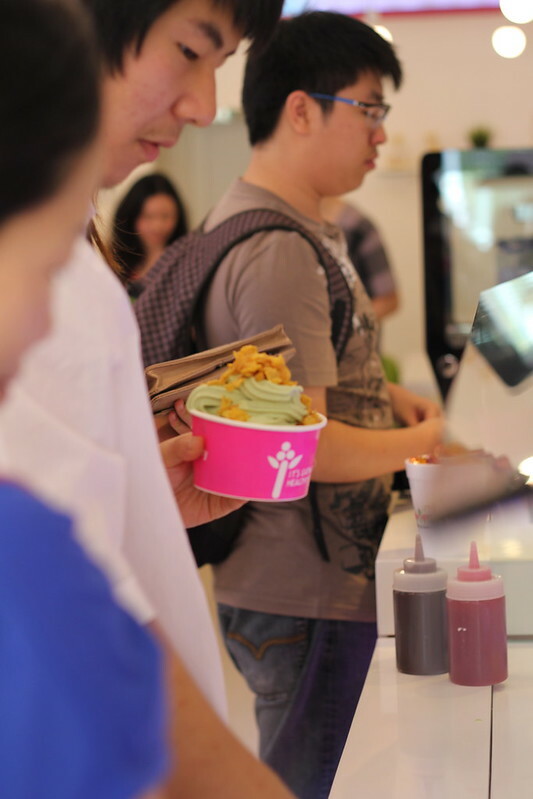 All flavours were pretty good but I mostly stick with taro and strawberry on my return visits – they are too good! I absolutely loved the lychee pearls to top with them. This was my first try of them and on every return I have basically gone nuts and put giant servings on each order I get. 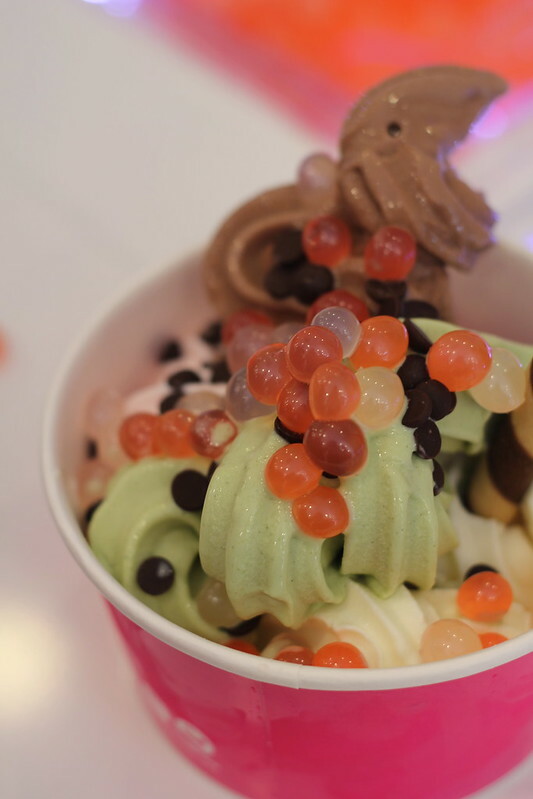 Basically a ‘would you like some froyo with your pearls?’-type situation, but they are amazing! Nothing like the sort of pearls you get from Easyway or Chatime. 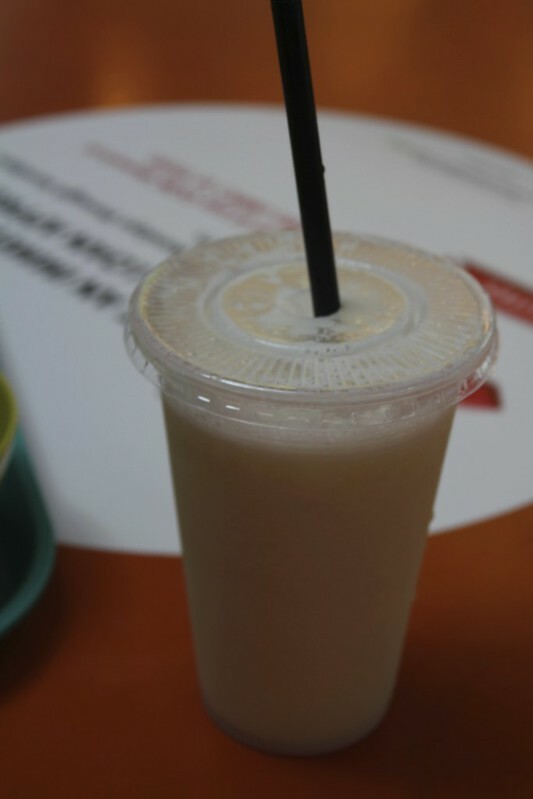 These pearls ‘pop’ in your mouth when you crunch down on them, rather the chewy pearls in bubble tea drinks. If you haven’t before, I highly recommend giving them a try! 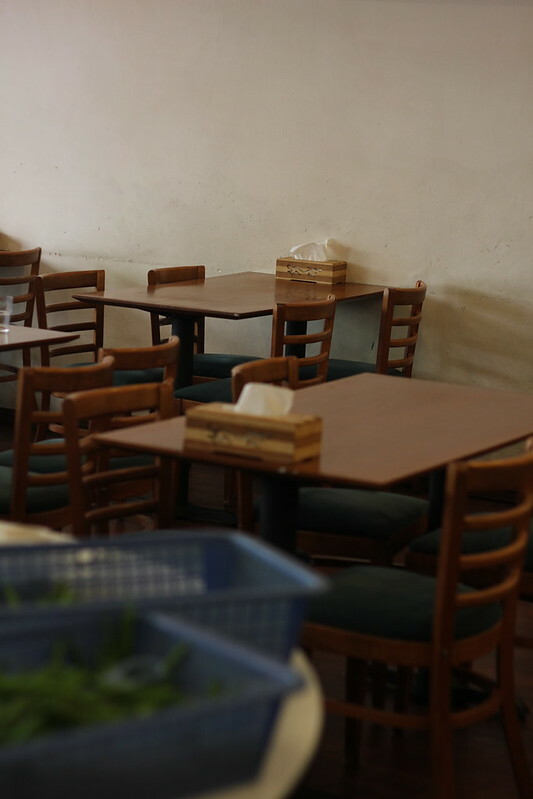 They have a good amount of seating for those who wish to eat in. 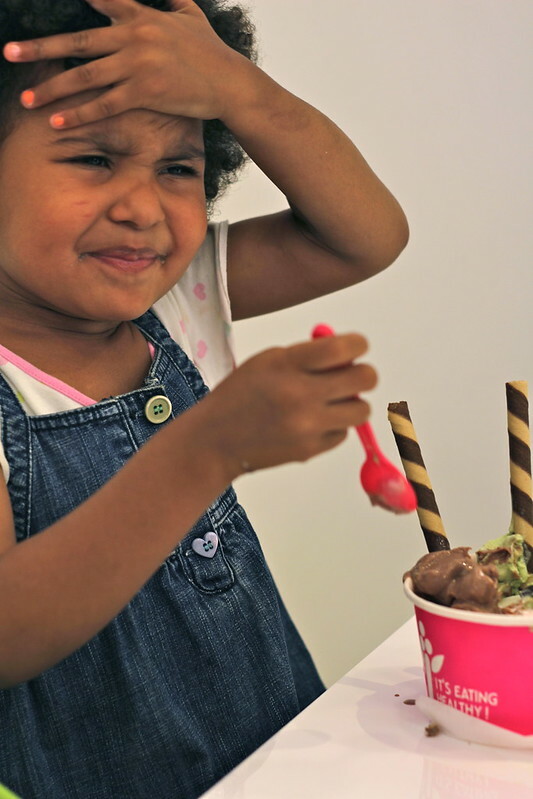 I couldn’t resist including these pics of my god-daughter Talei getting a brain freeze. Not that that deters her from eating more froyo haha. Good girl. Haha I love this video. 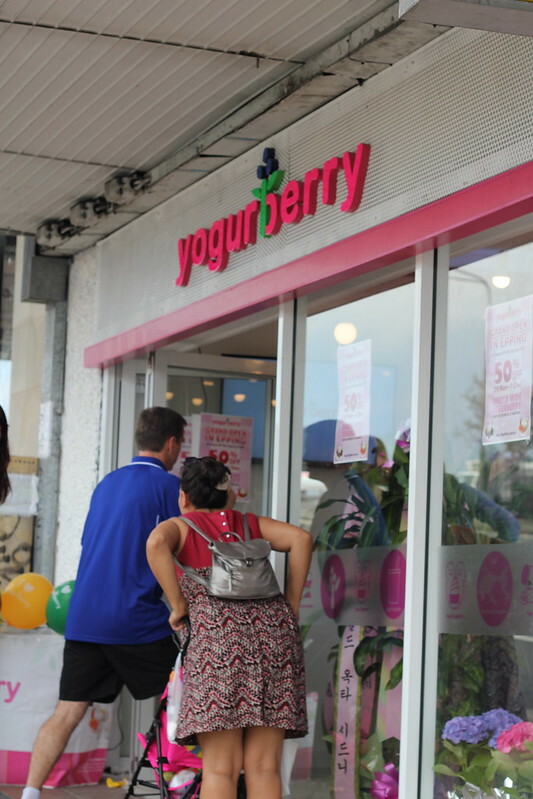 Yogurberry, Epping is at 43 Beecroft Road, Epping, NSW. Parking is probably best found at Coles on Rawson Street in Epping, but it’s also a super quick walk from Epping station. 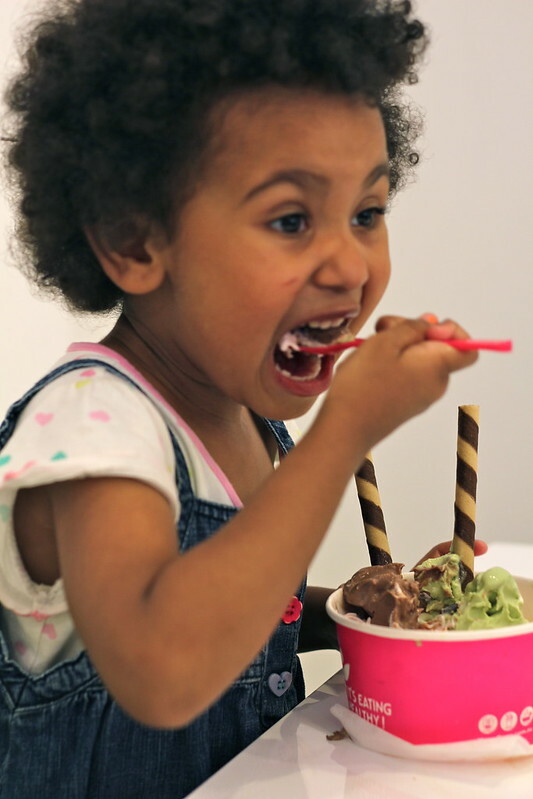 I can’t wait to enjoy more froyo goodness over the summer period! 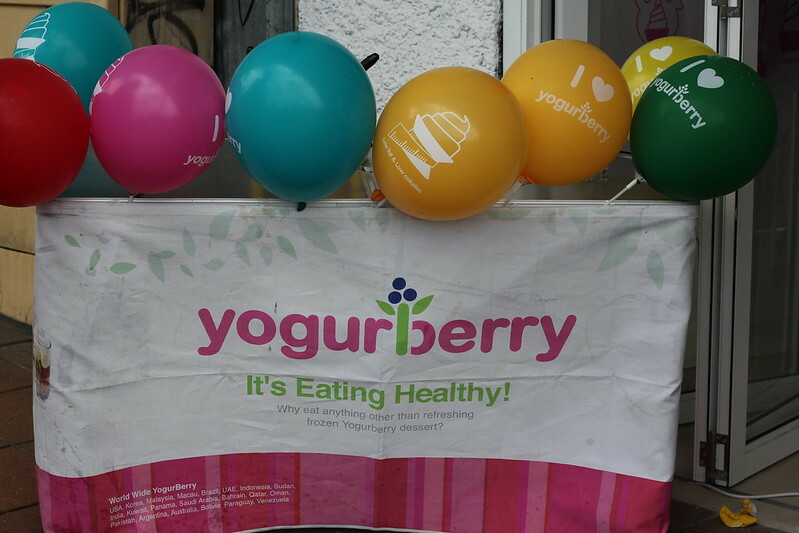 Psst, if you’re interested, check out their website — they have plenty of nutritional advice about their frozen yoghurt. Oh thought I’d also mention that Yogurberry is cash only! Hope you’ve had a great start to the week. Not long to Christmas now, eeeee!! !